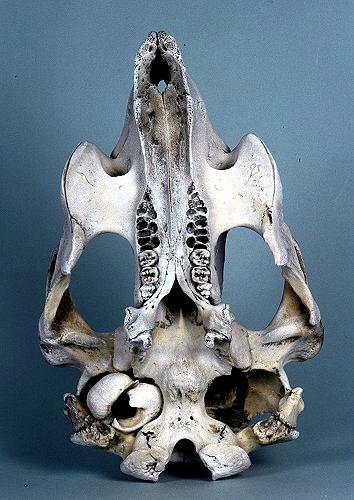 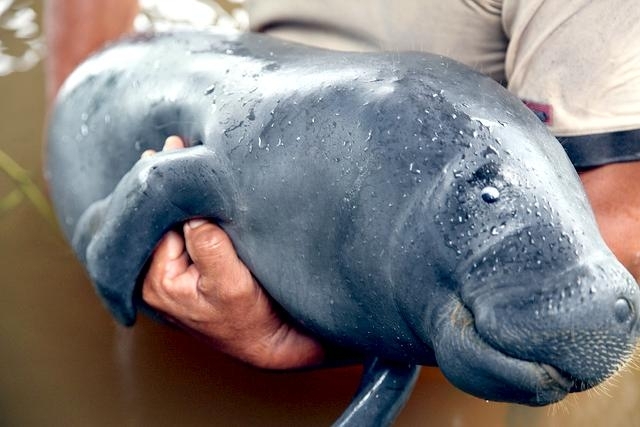 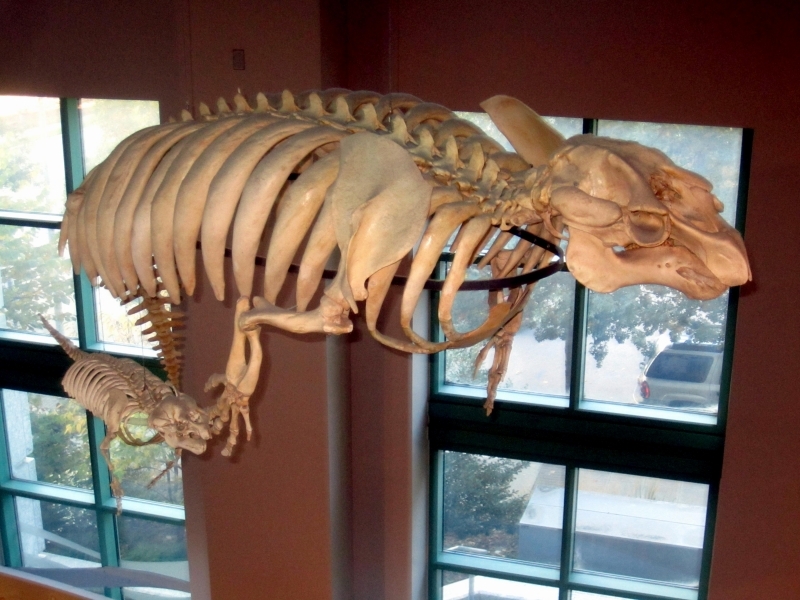 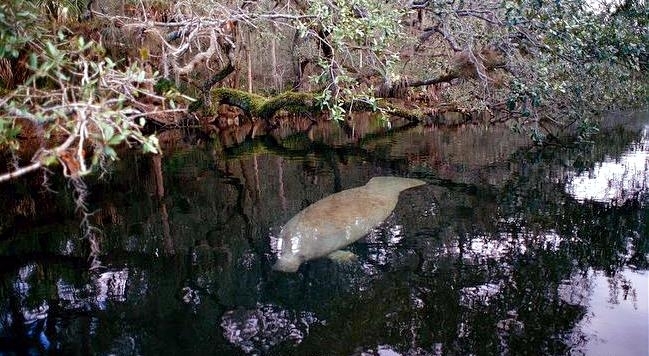 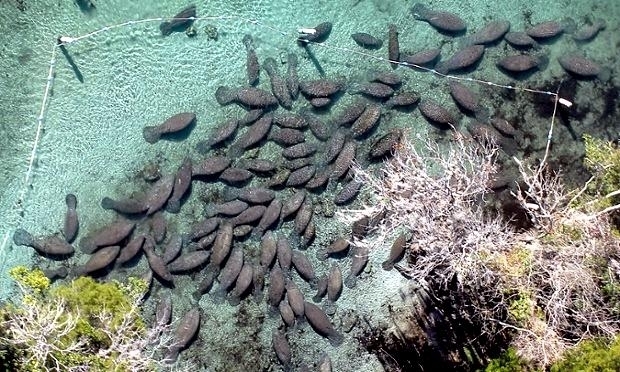 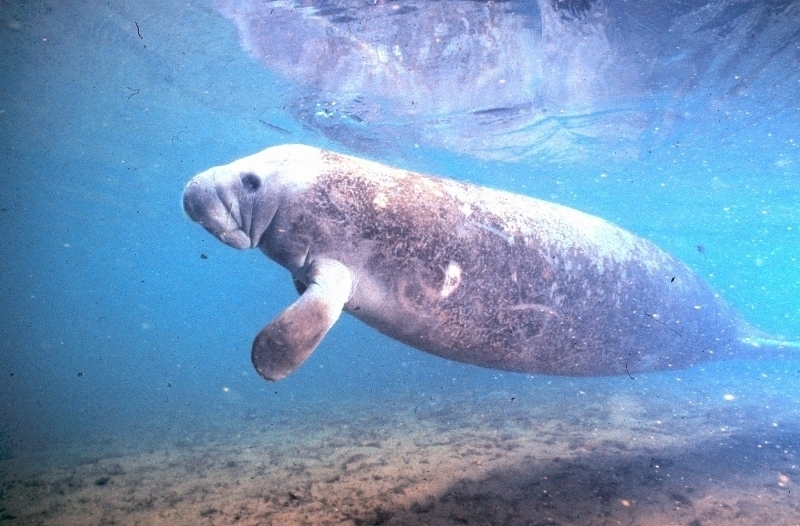 The Manatee has a large, seal-like body that tapers to a powerful flat tail. 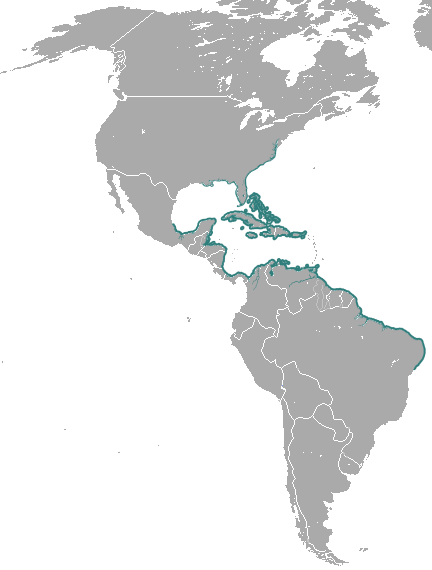 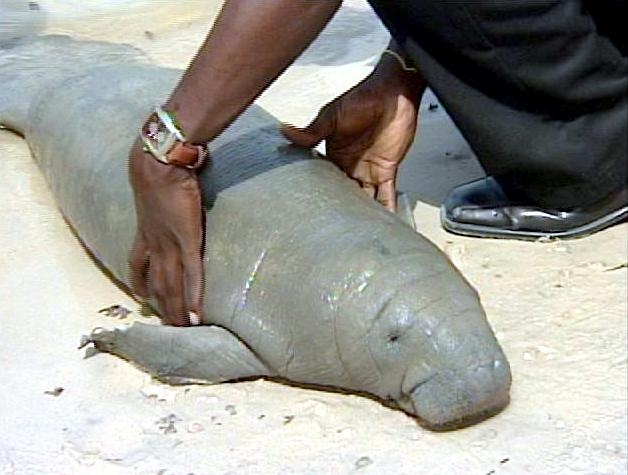 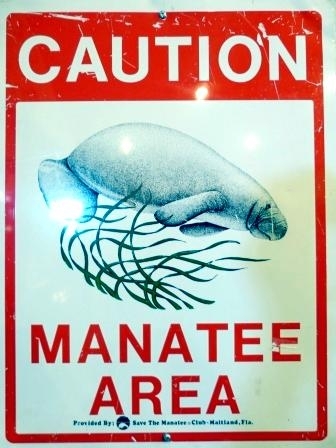 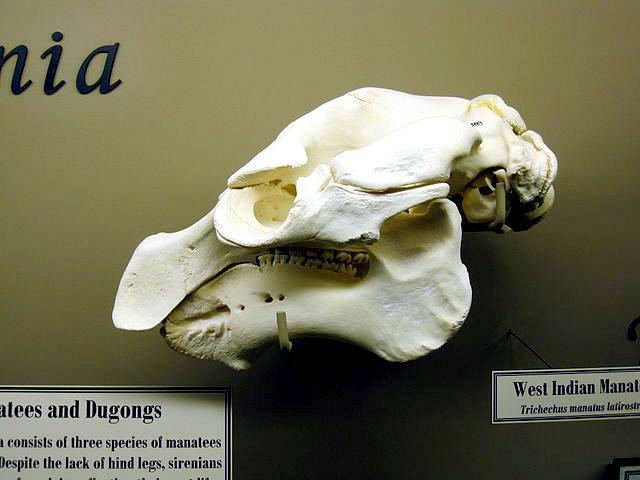 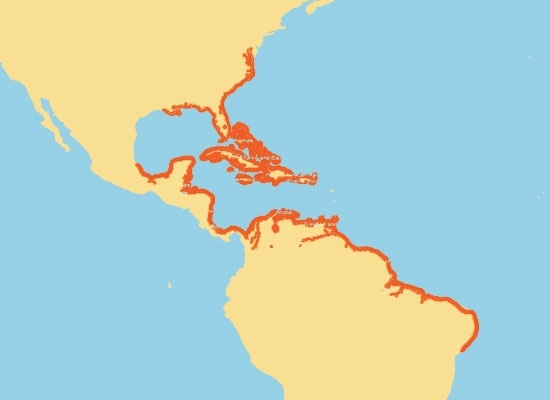 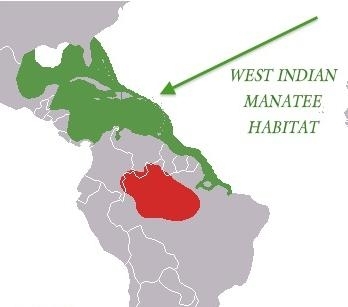 The actual name of the Manatee is listed as the West Indian Manatee. 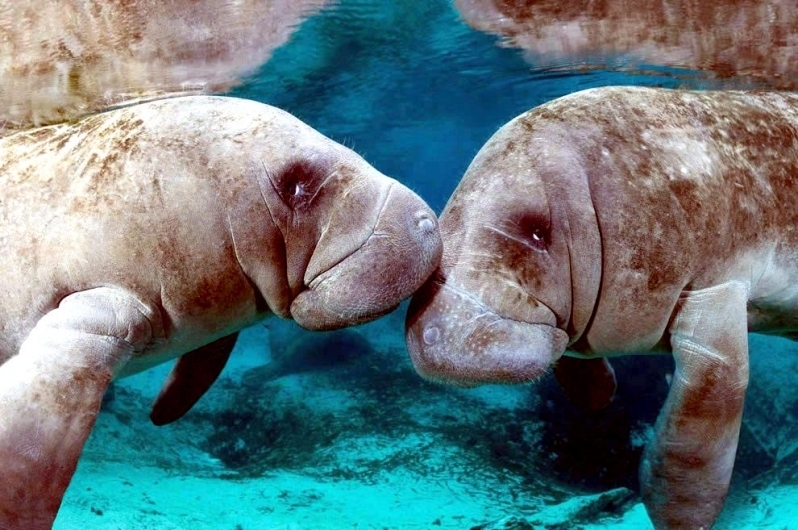 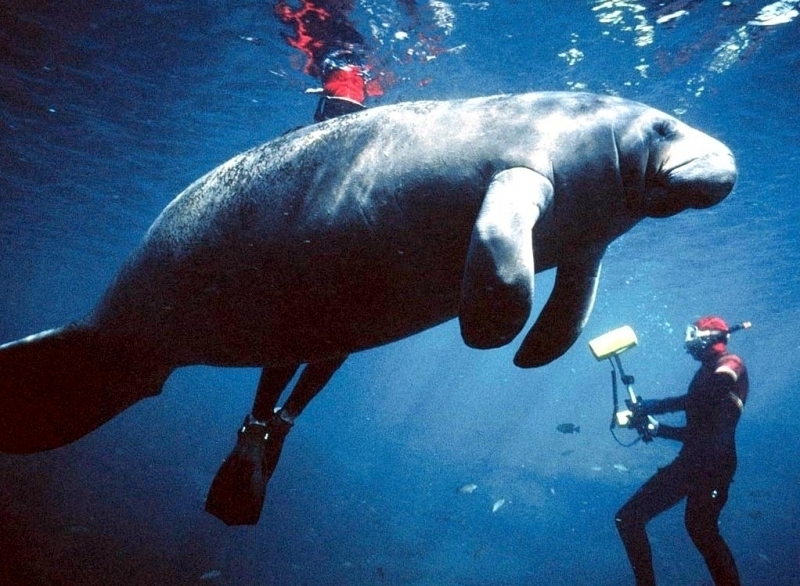 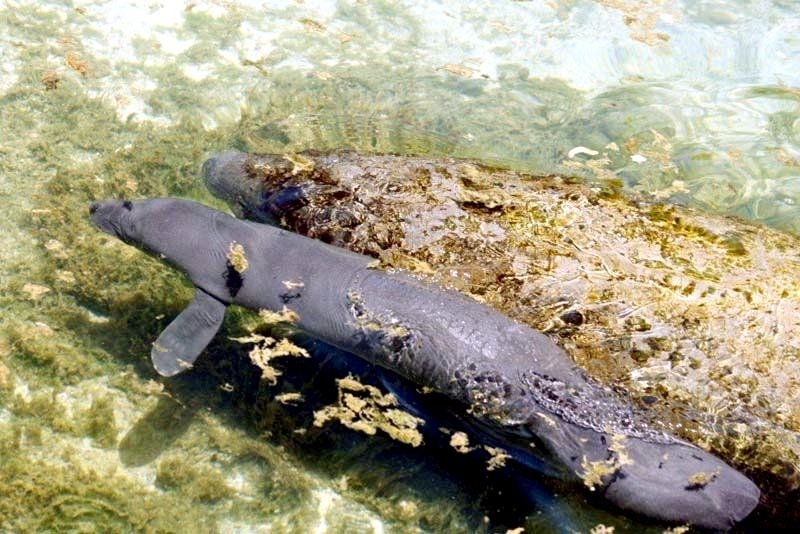 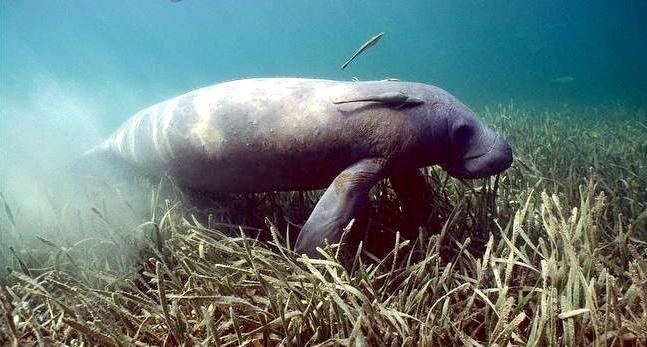 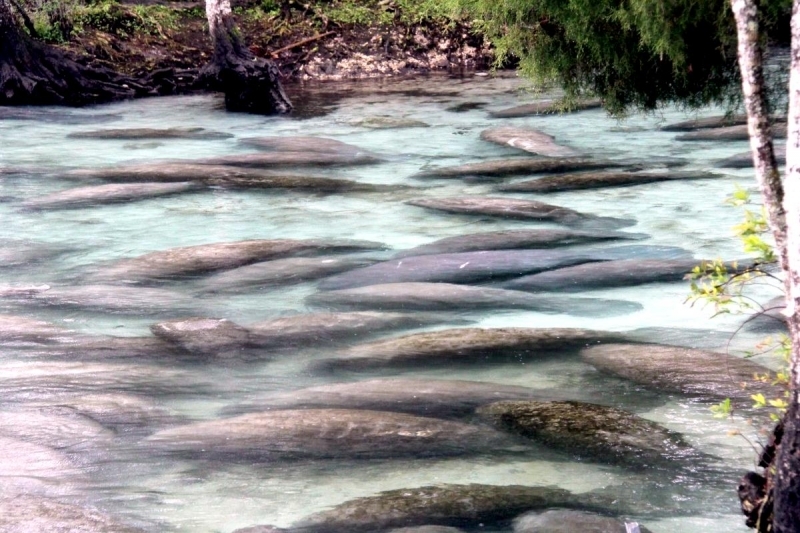 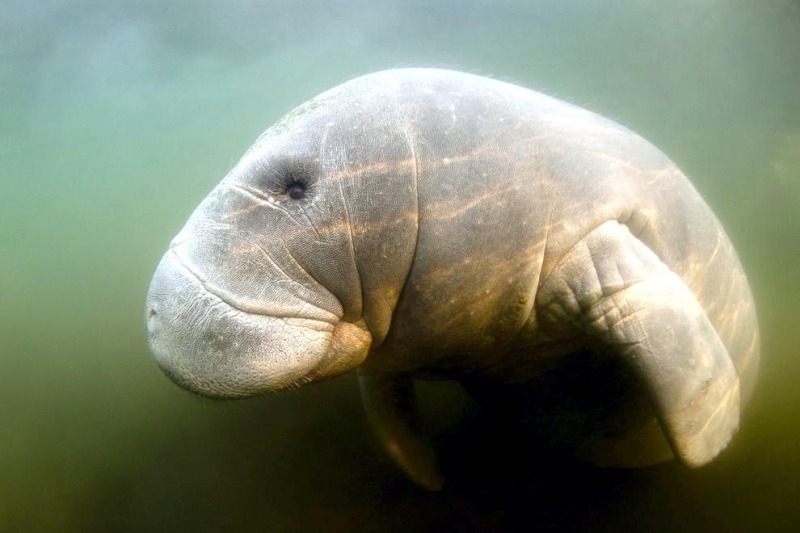 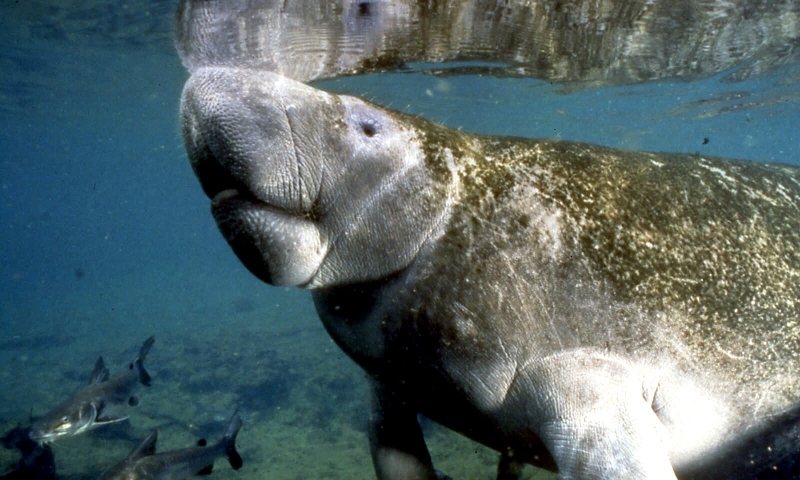 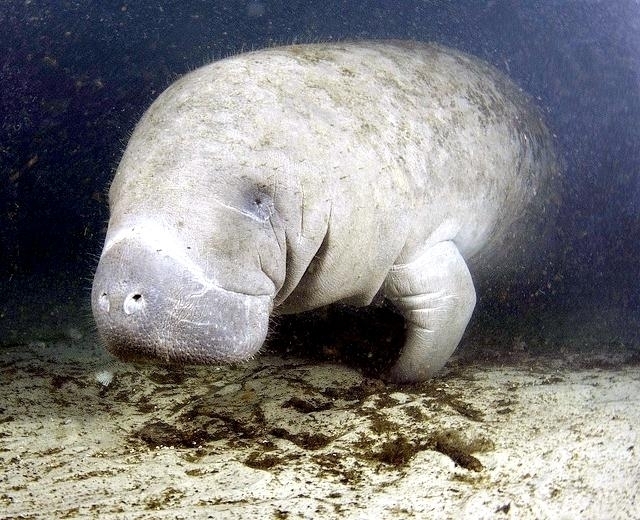 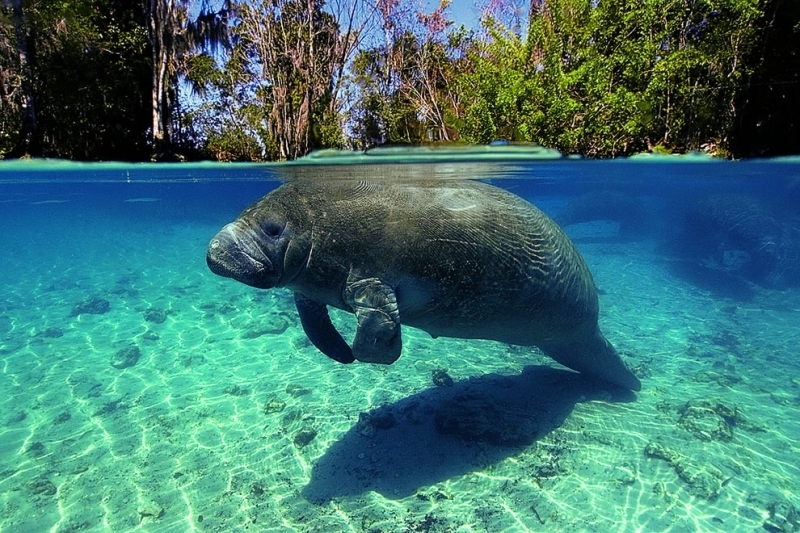 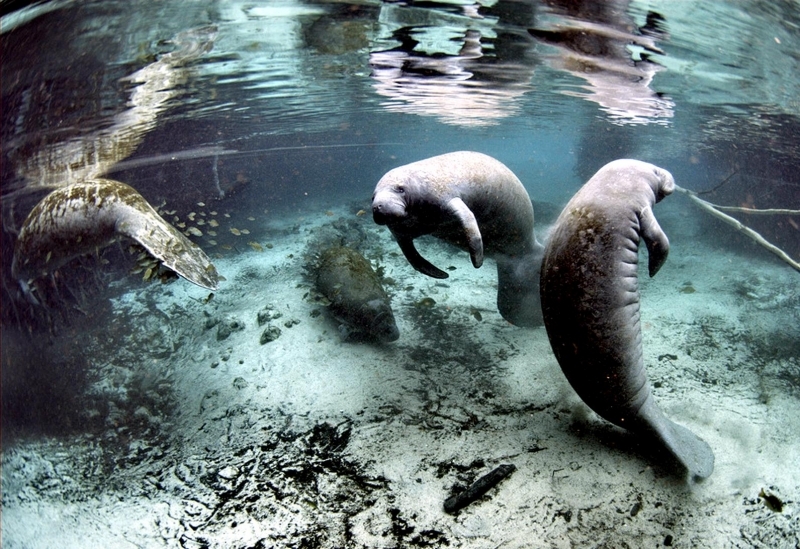 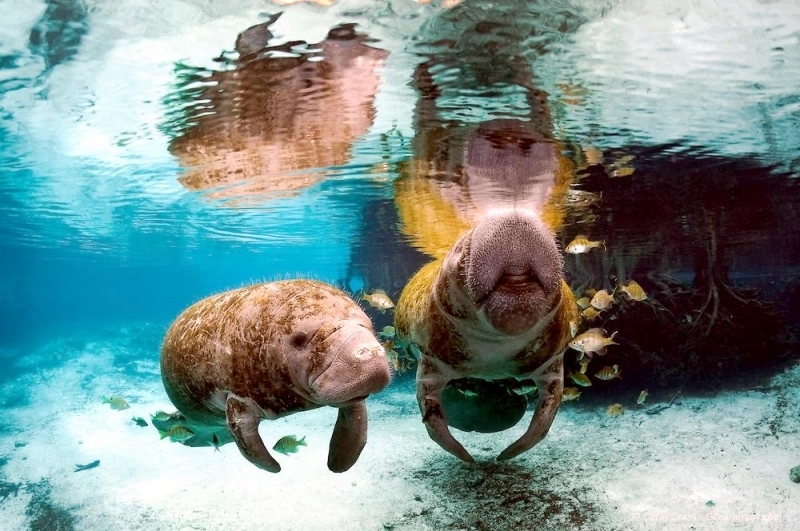 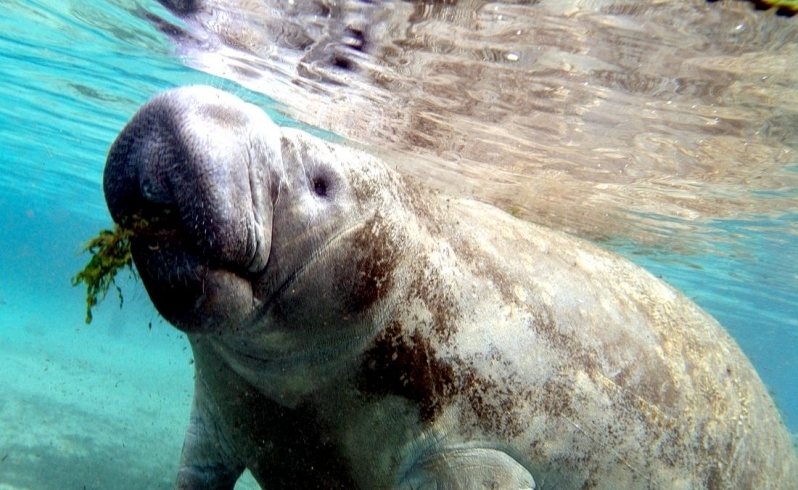 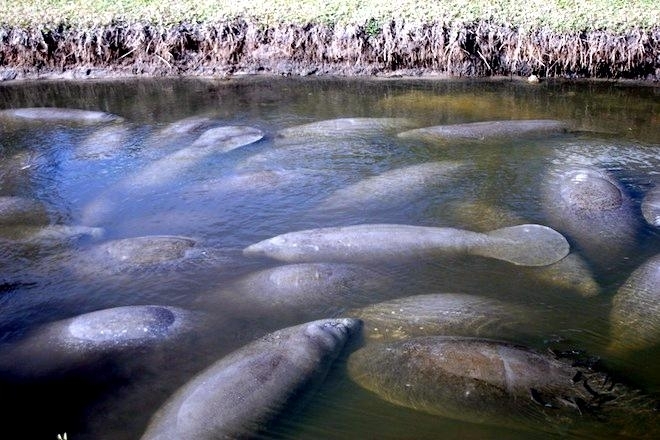 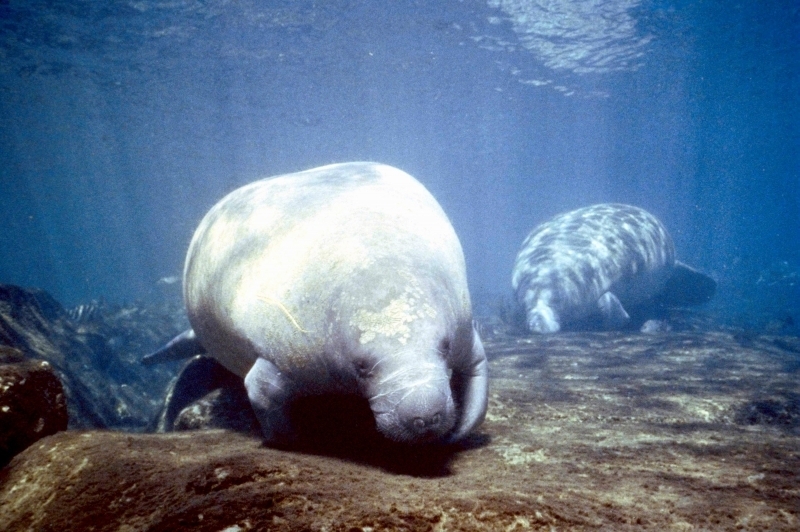 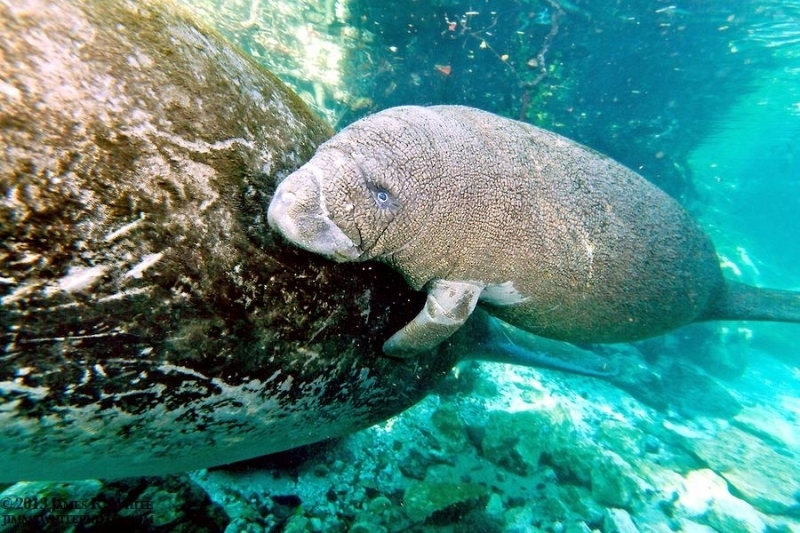 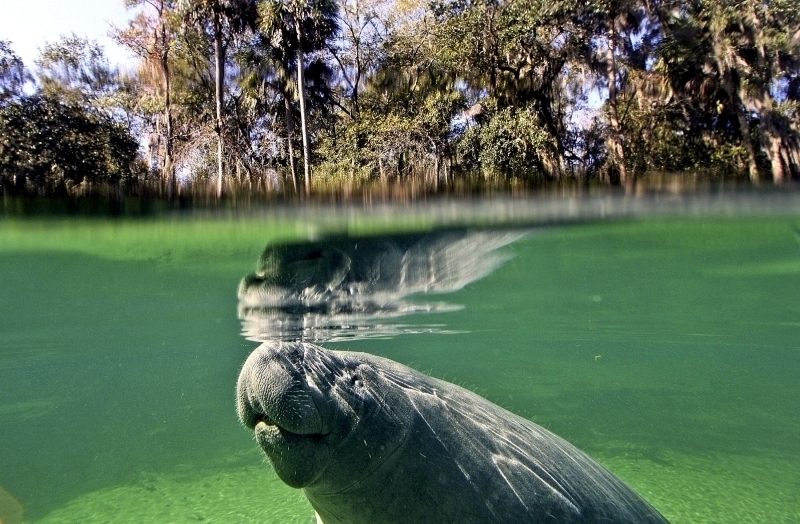 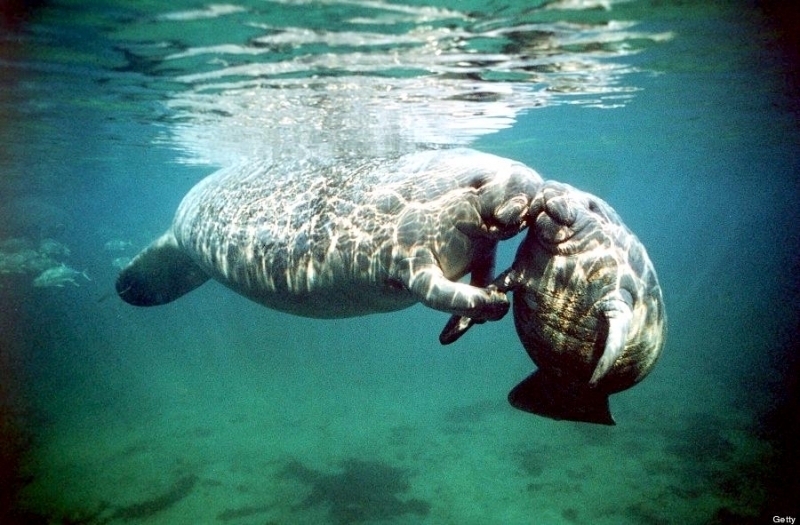 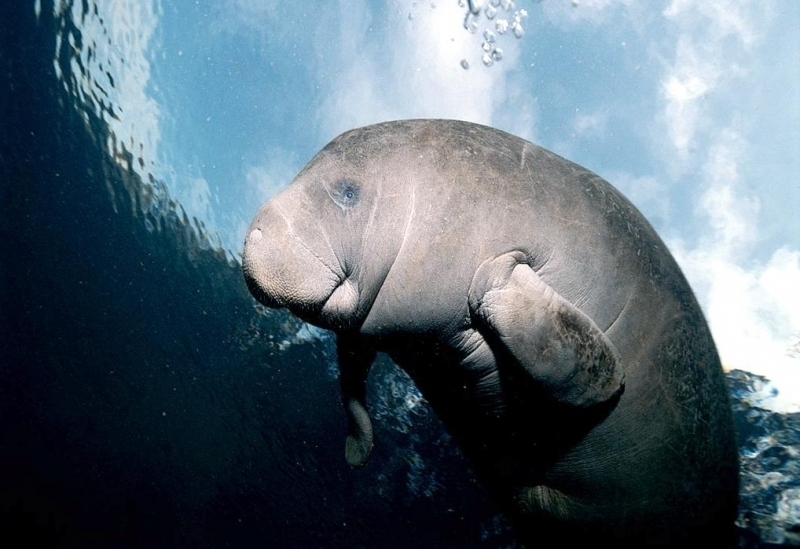 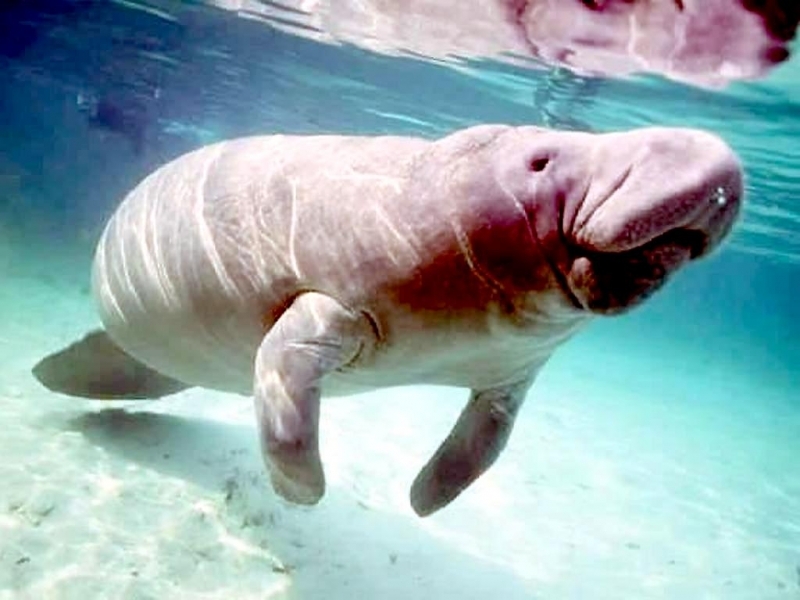 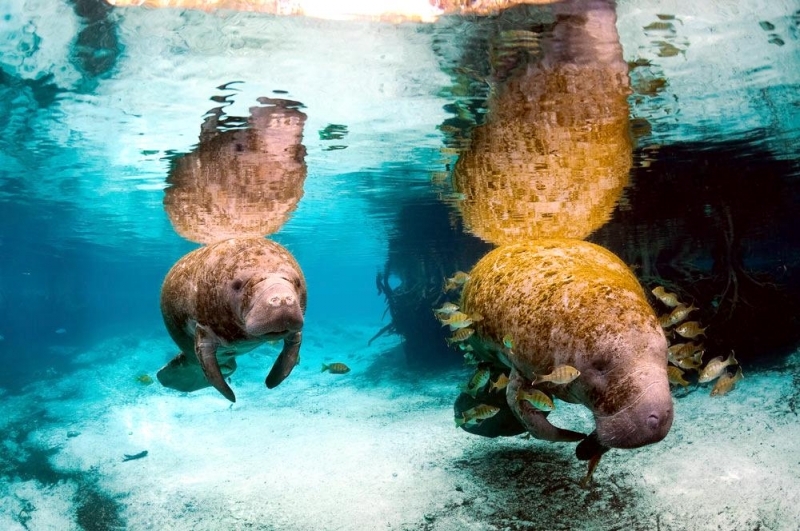 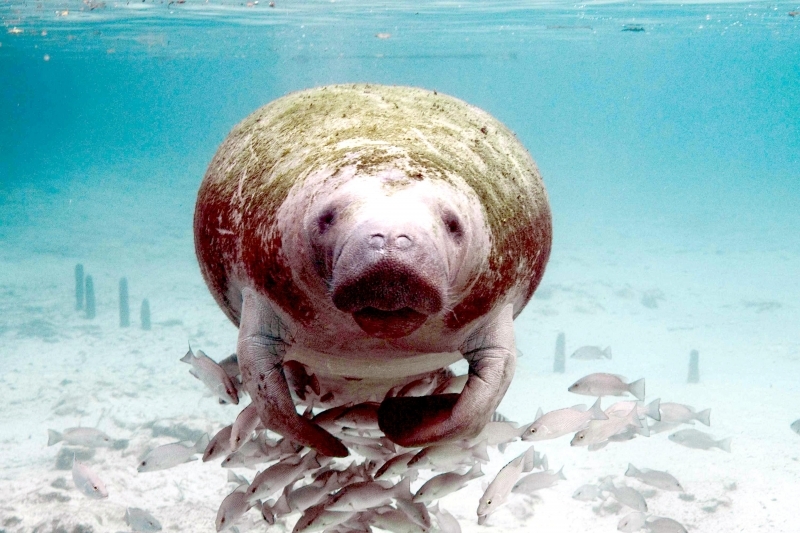 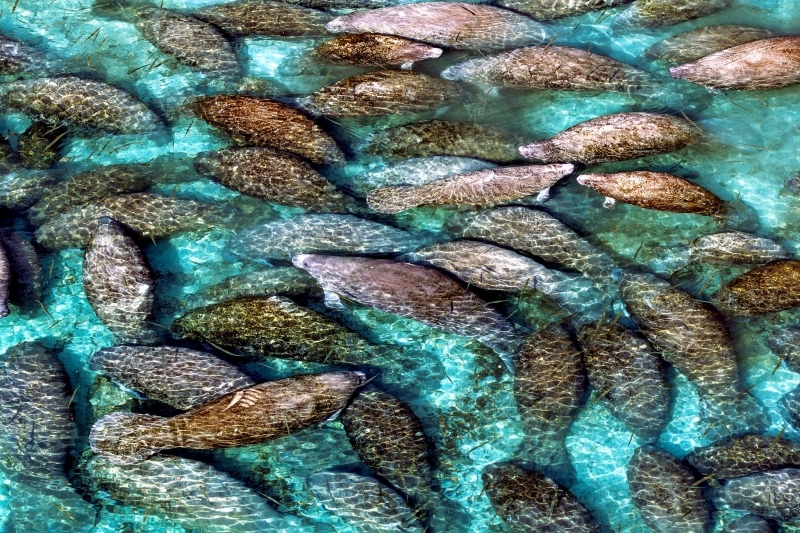 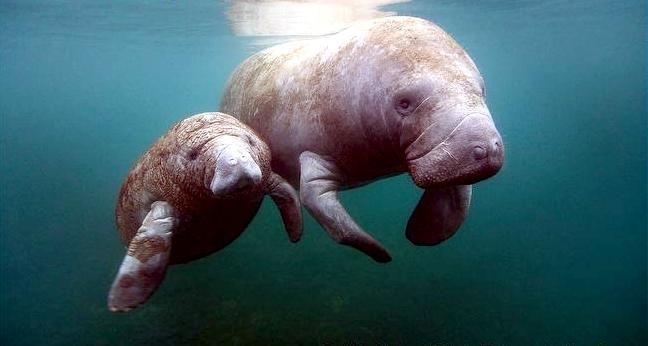 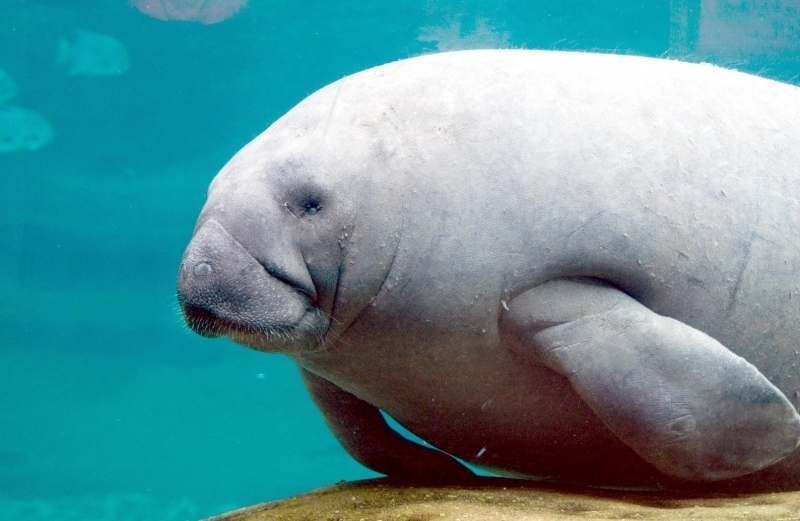 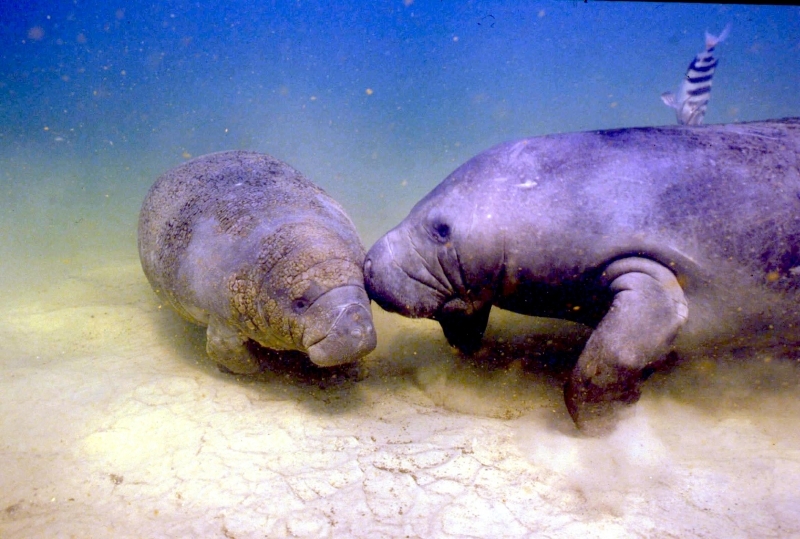 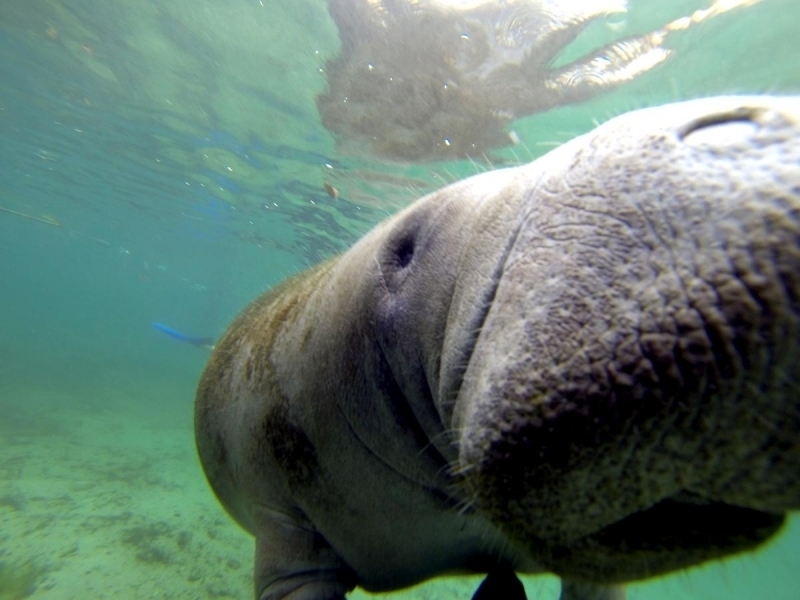 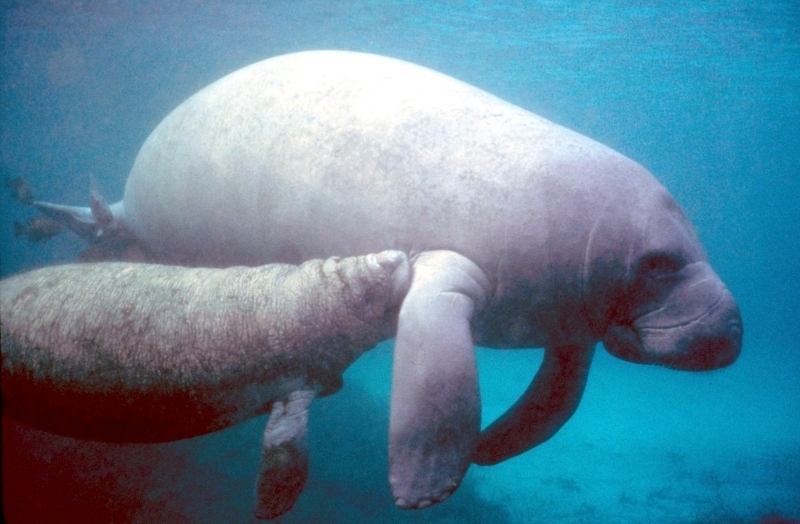 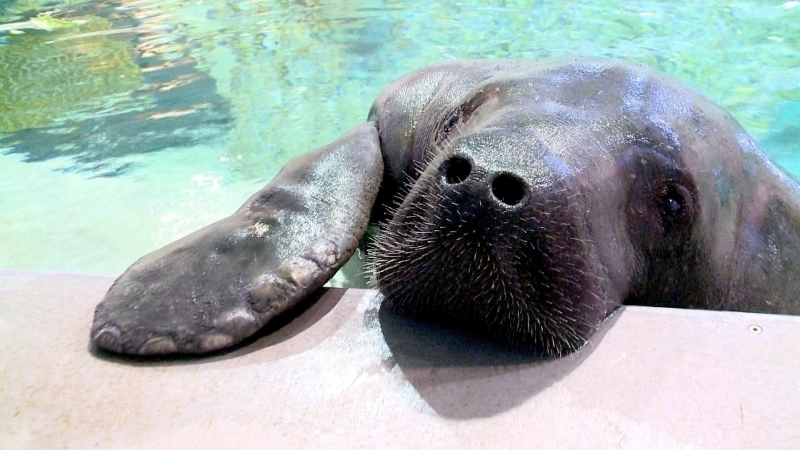 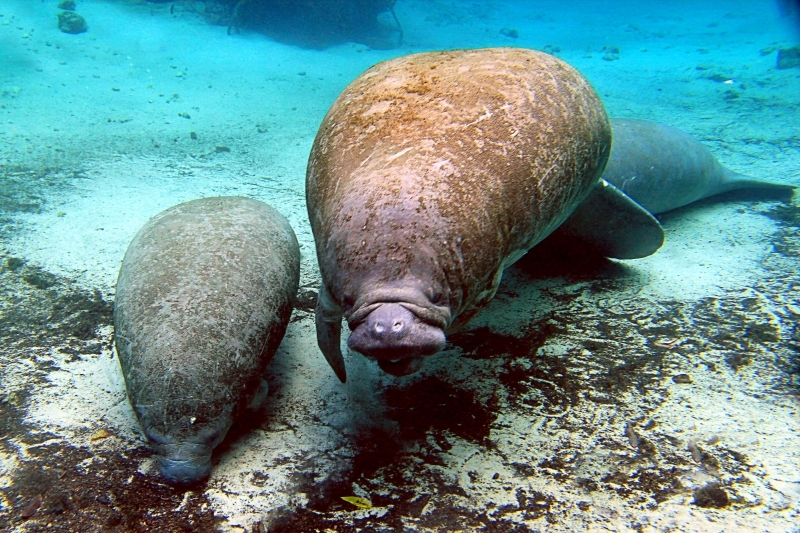 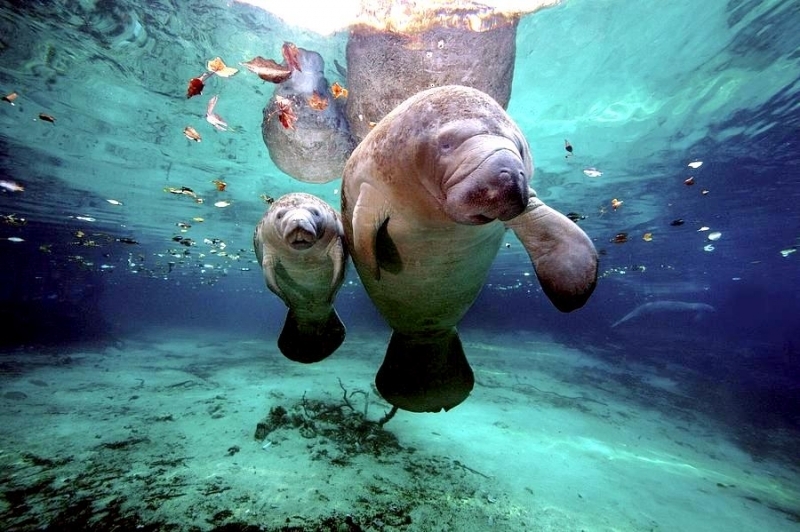 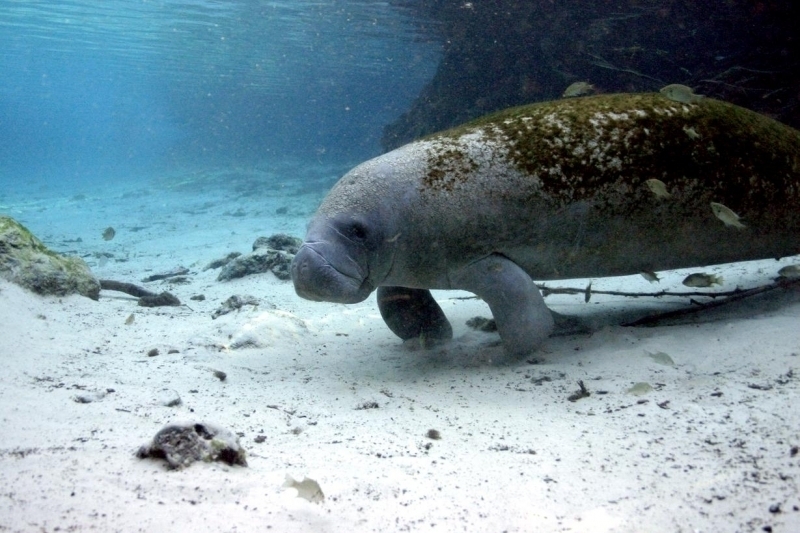 The name Manatee itself comes from the Haitian word “manati” meaning “breast”. 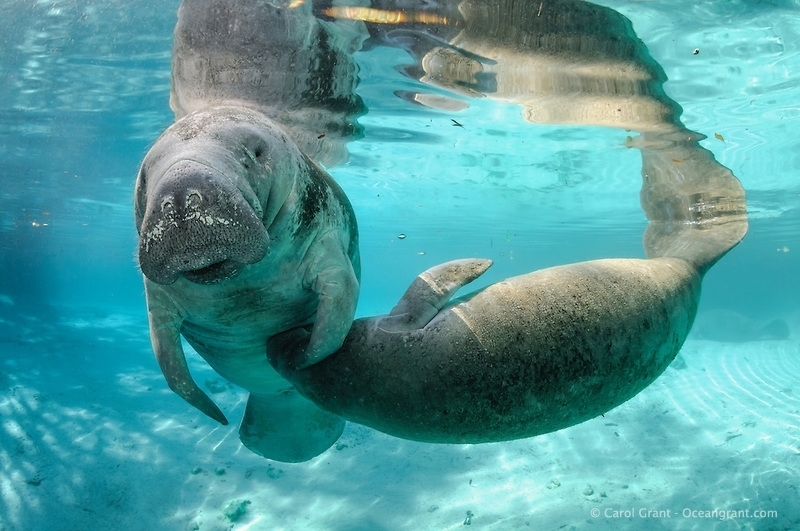 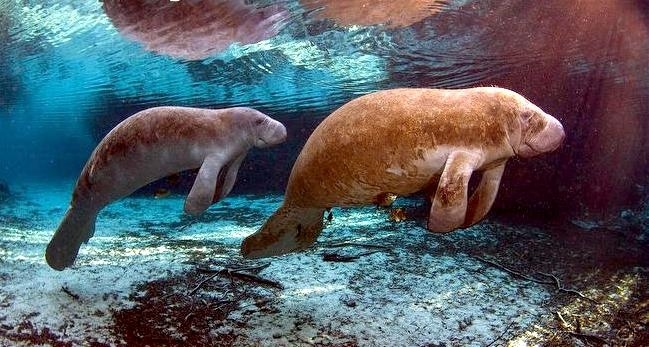 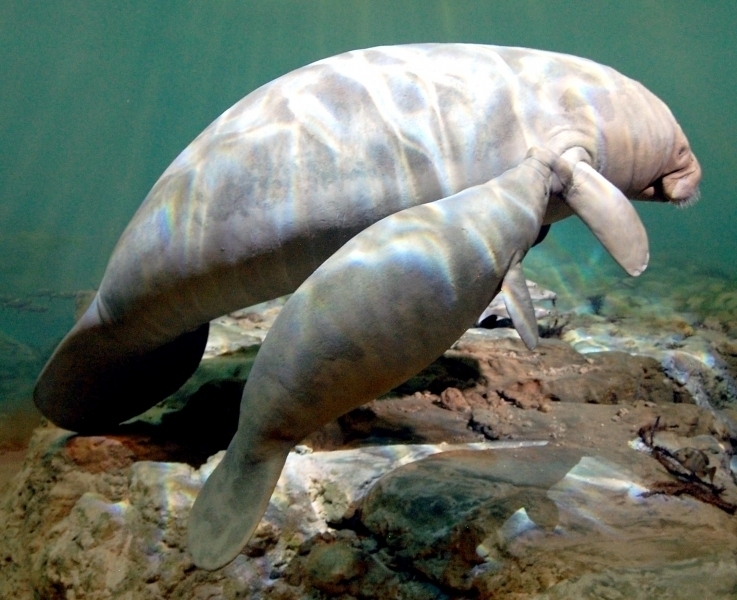 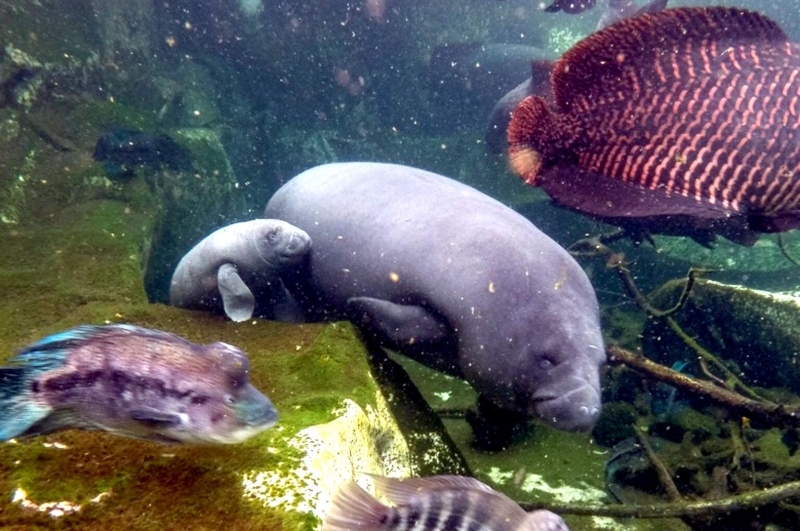 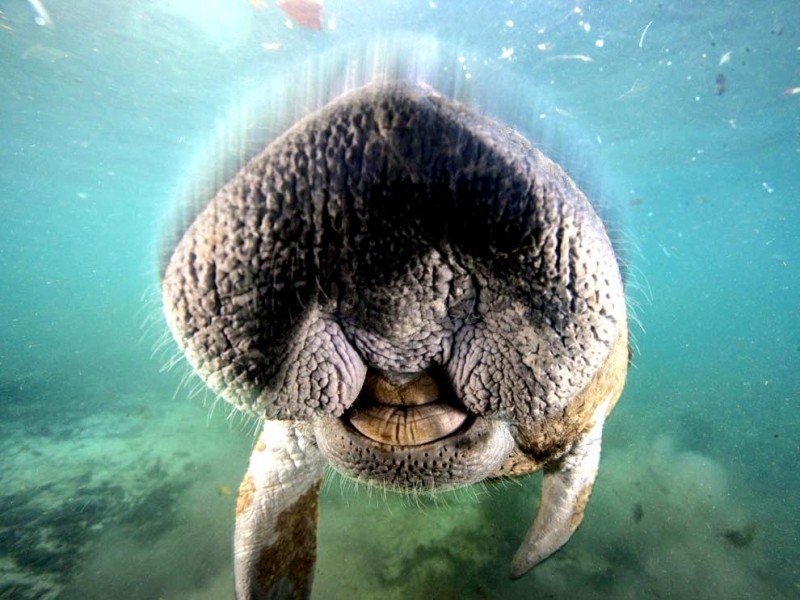 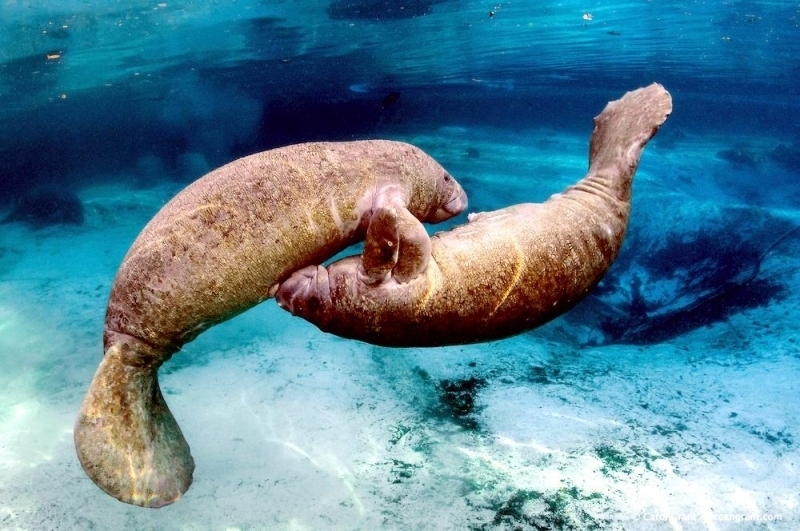 With 2 agile forelimbs with 3 to 4 toenails on each, they act like arms to help the Manatee maneuver in shallow water, grasp and move food toward their mouths and act like flippers during swimming. 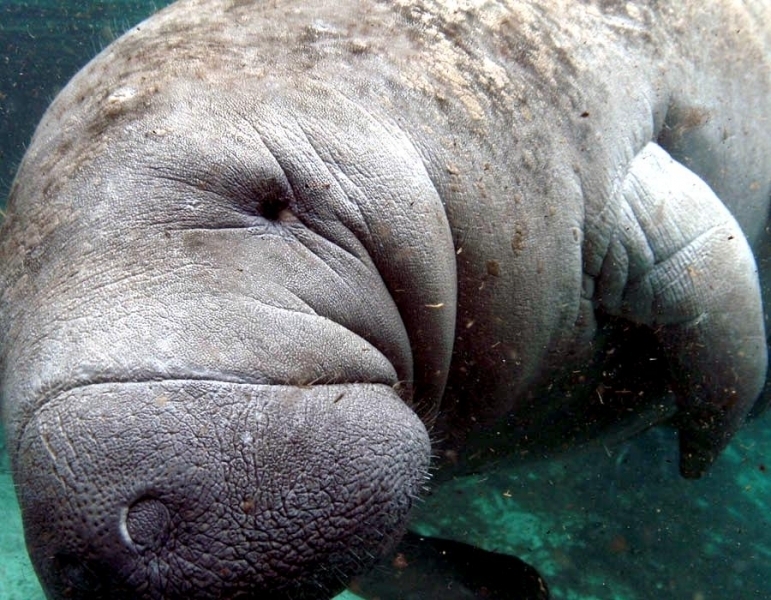 Thick and wrinkled skin with a rough texture, a bit jiggly under the neck and arms. 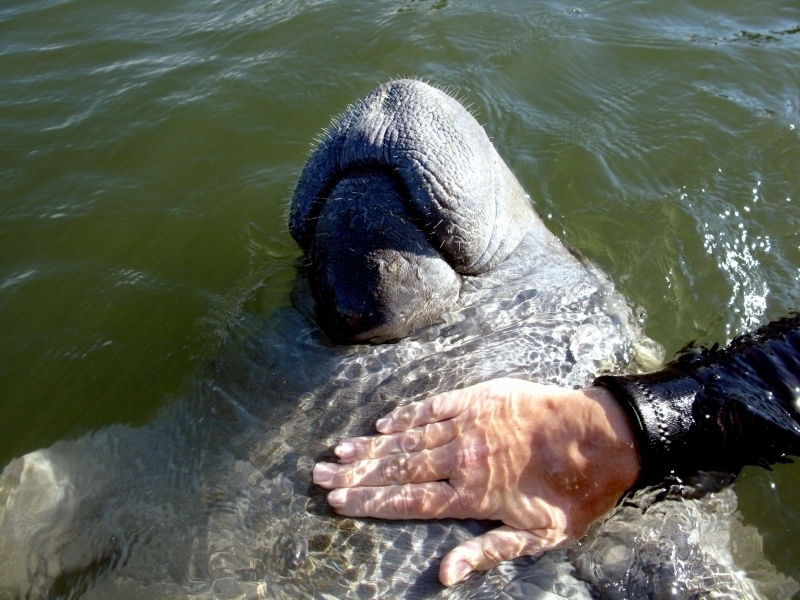 Their skin reacts to touch as their bodies are very muscular, contracting and changing shape slightly when scratched or tickled. 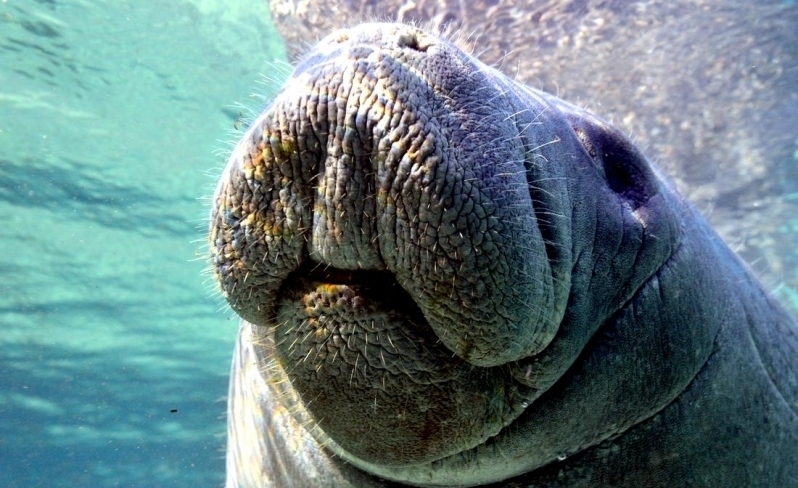 Powerful upper lips which articulate to help maneuver food or dig through sediment. 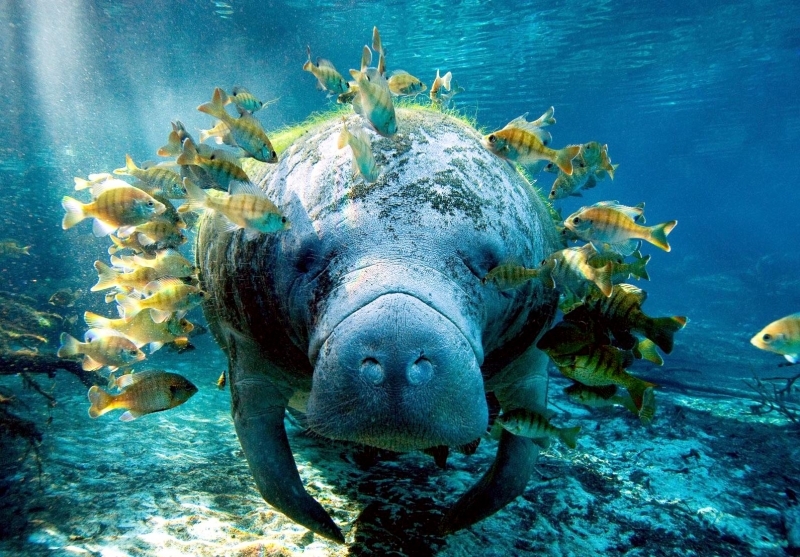 Average 9 to 10 feet, weighing around 1,000 pounds Manatees can grow as large as 13 feet and weigh more than 3,000 pounds. 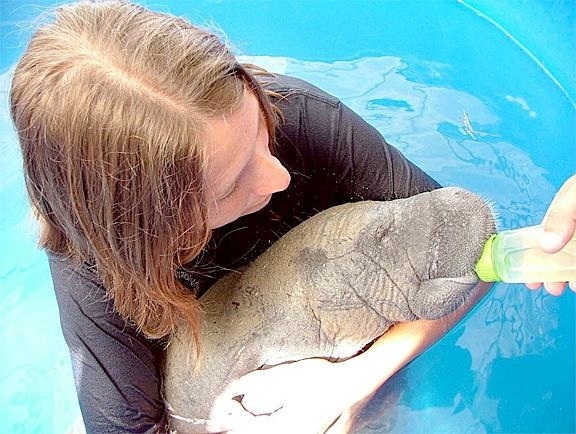 Calves are born weighing about 40 pounds, gaining about 700 pounds during their first year. 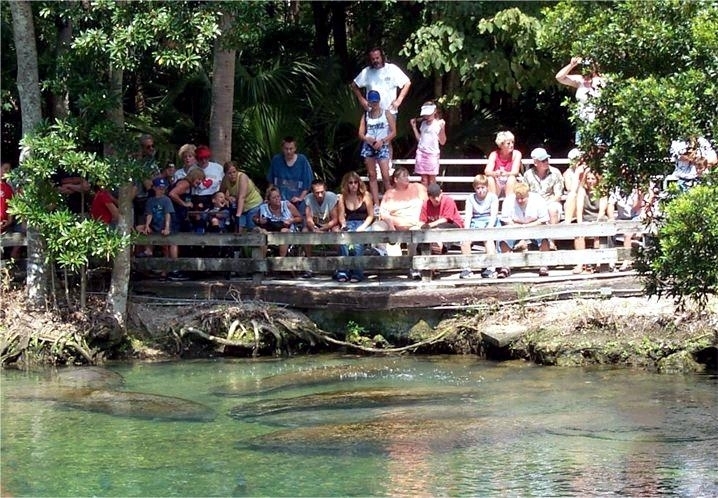 Gentle and generally slow-moving, Manatees spend most of the time eating vegetation (100-150 pounds per day), resting & traveling. 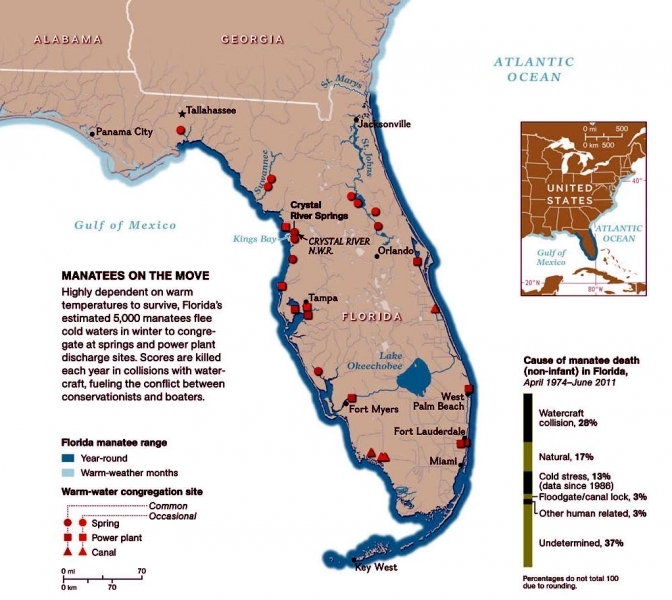 On average, Manatees can travel about 4-5 miles a day sometimes farther. 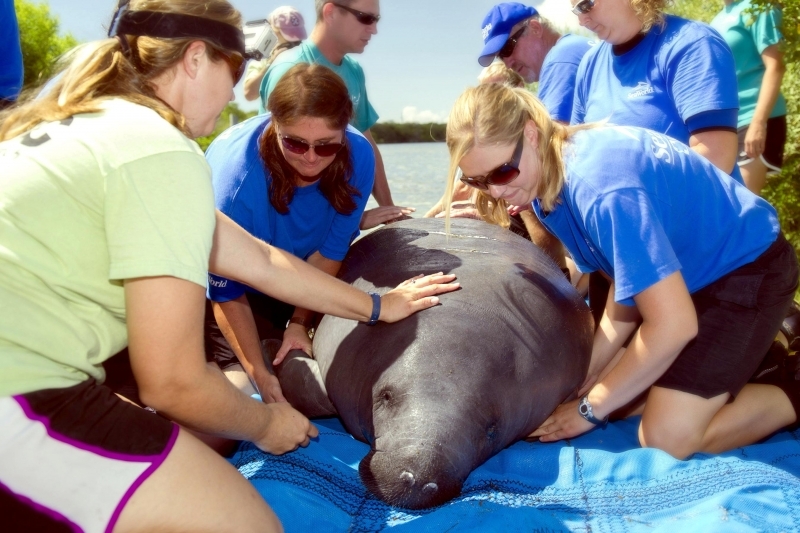 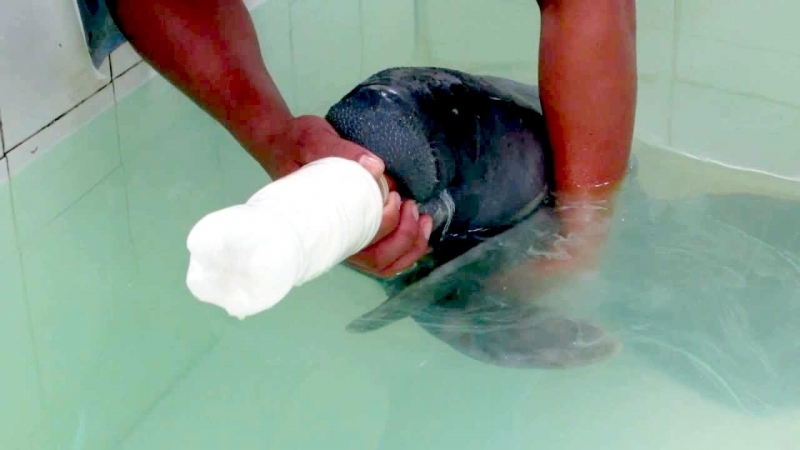 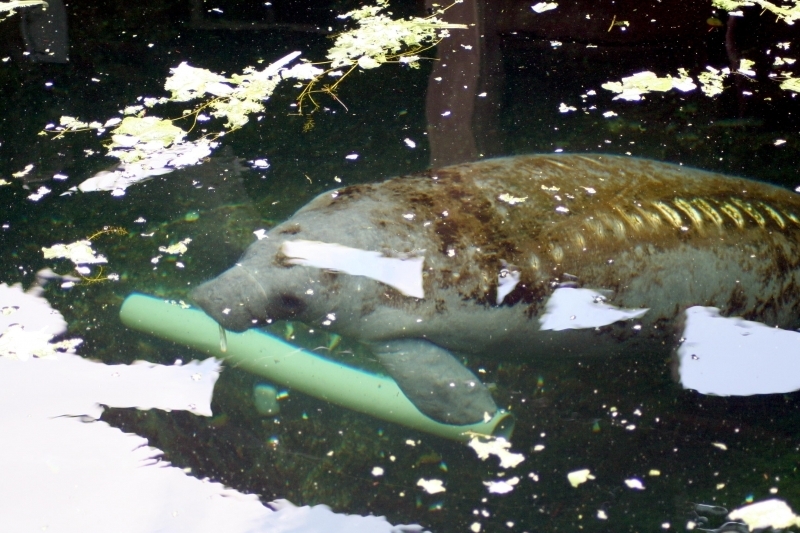 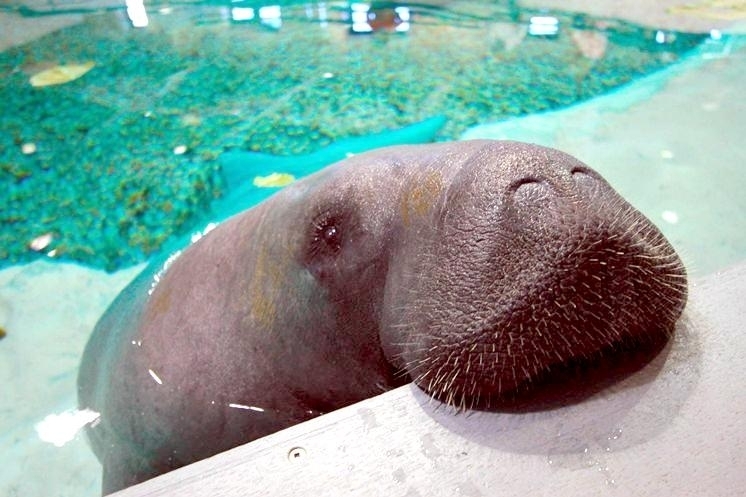 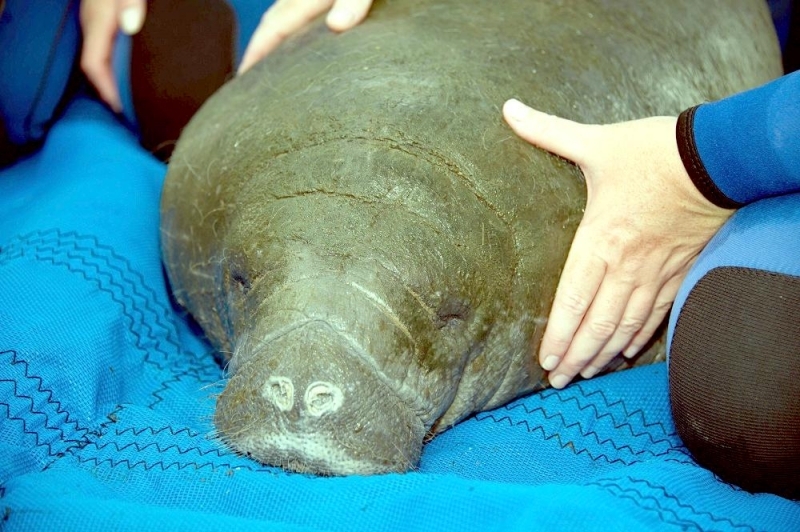 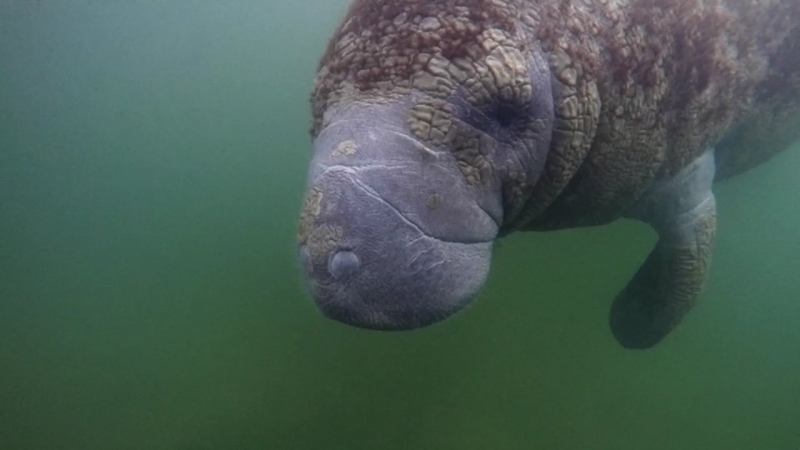 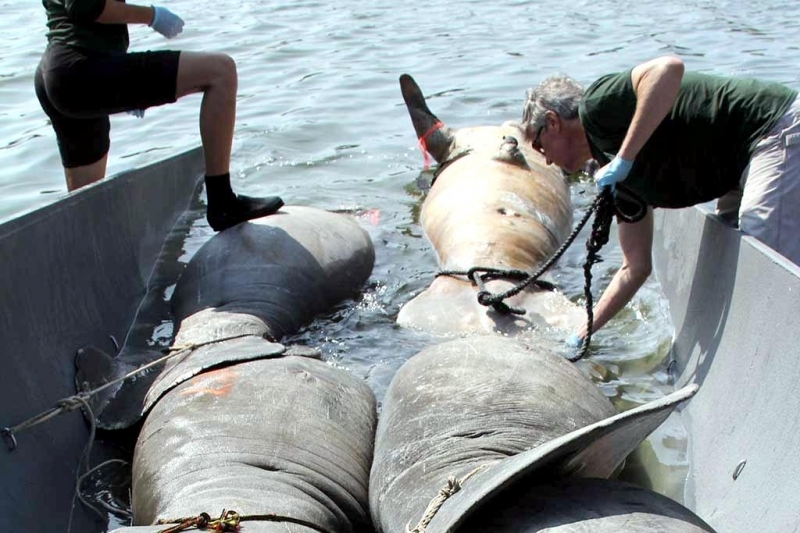 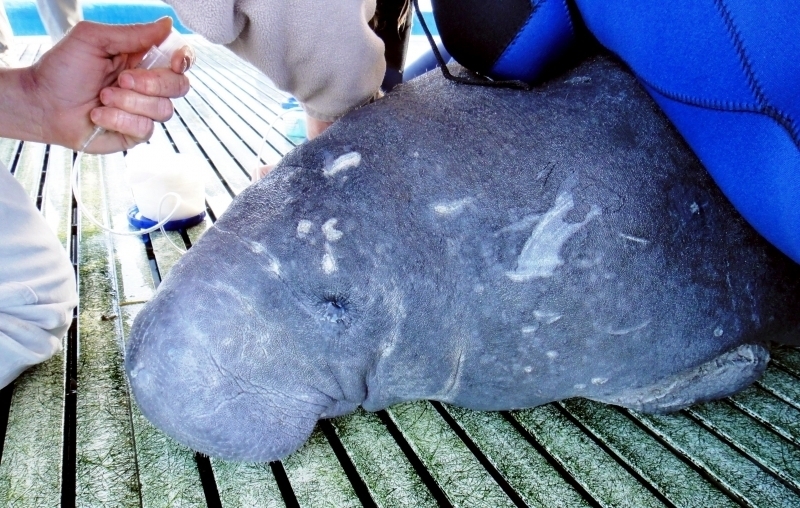 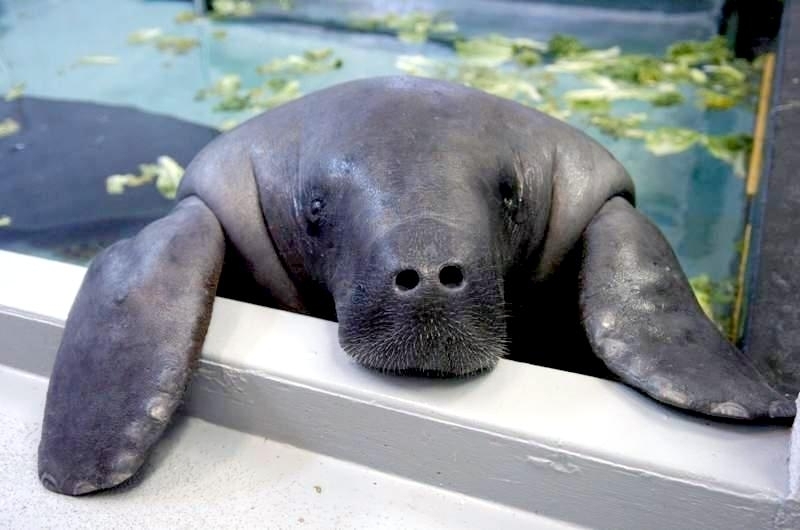 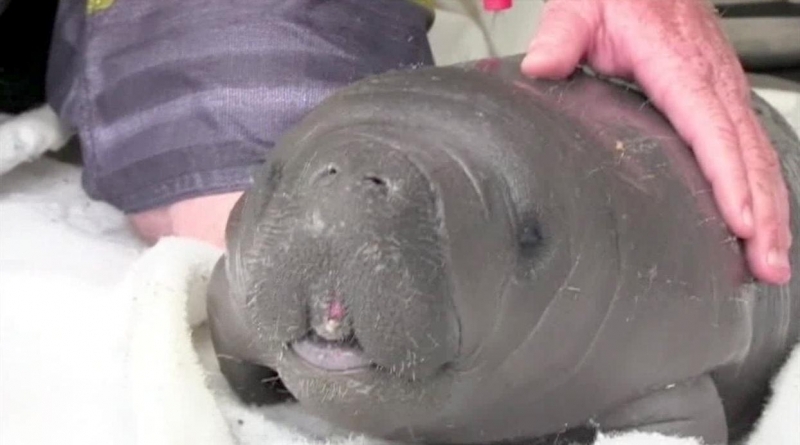 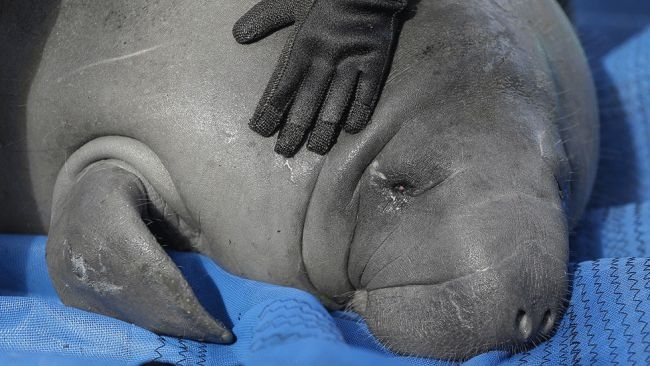 Chessie, the famed Manatee rescued from the cold waters of the Chesapeake Bay and returned to Florida, was tagged with a locating device which showed he traveled as far as Rhode Island during hot summer months. 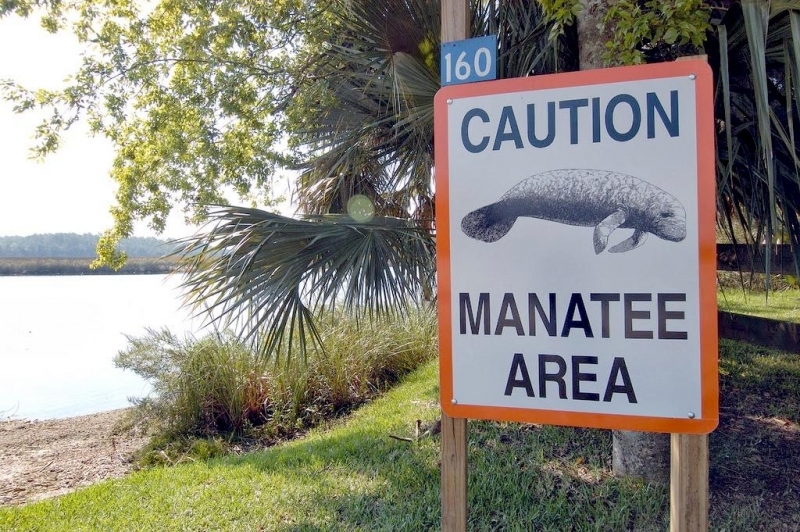 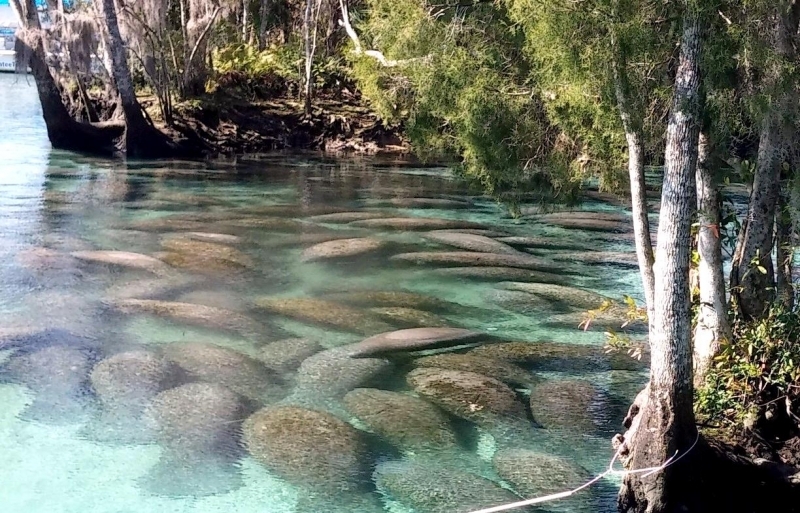 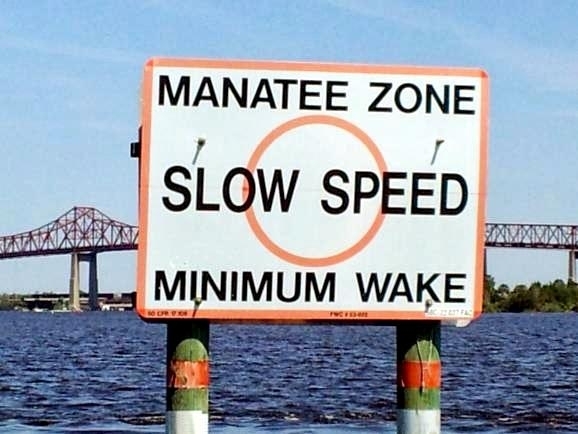 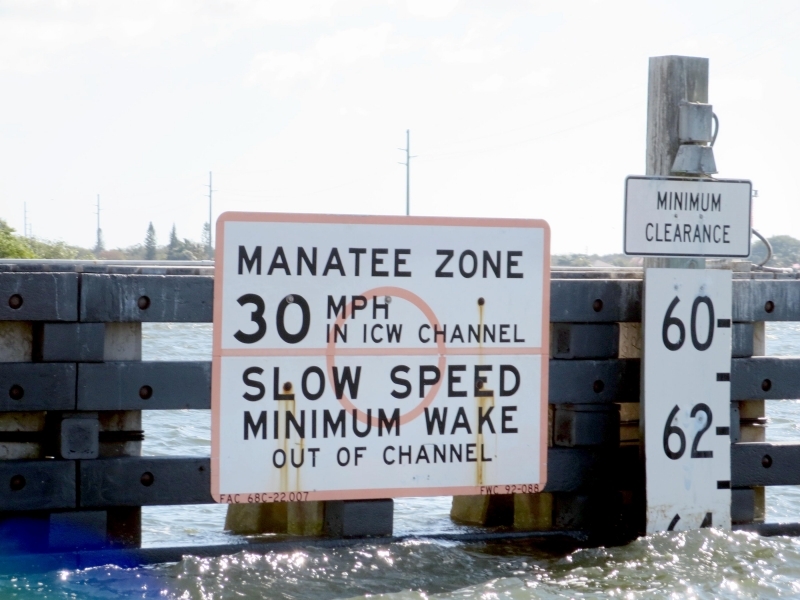 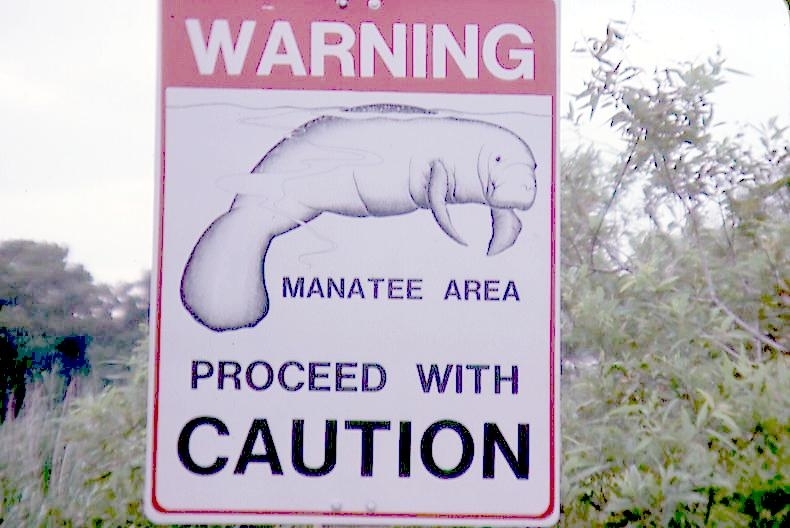 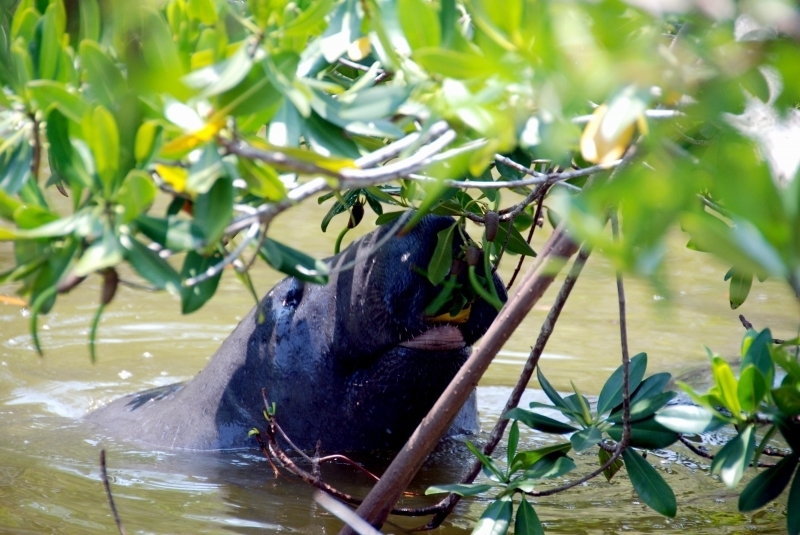 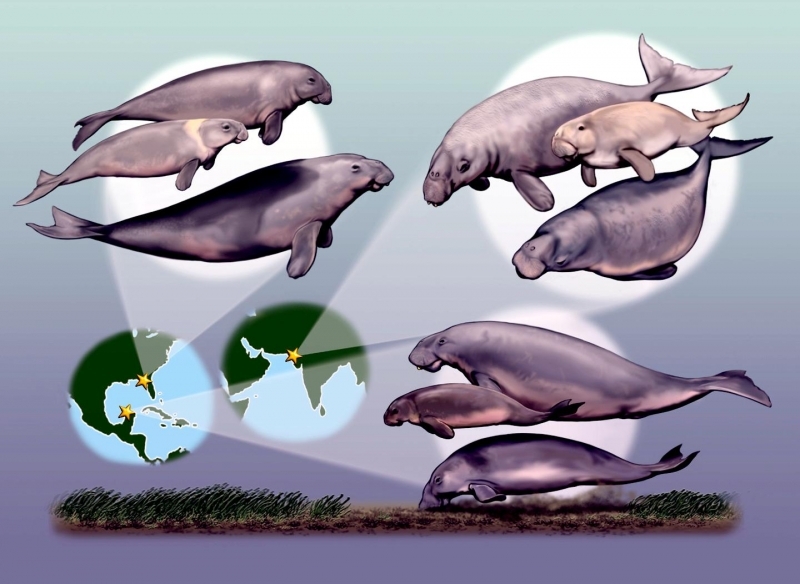 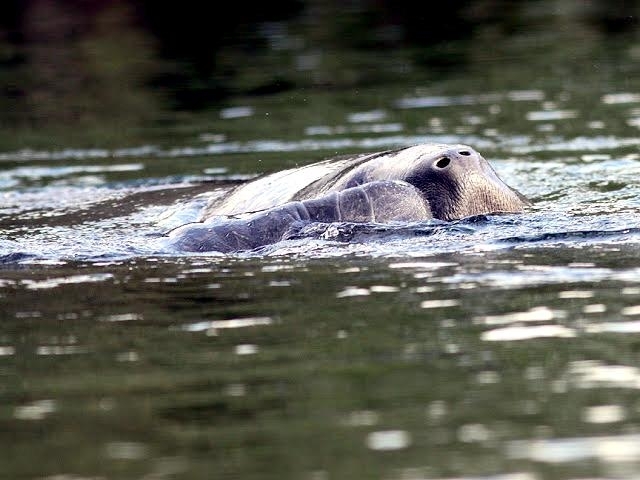 Some people believe Manatees are near-sighted or may have limited depth perception. 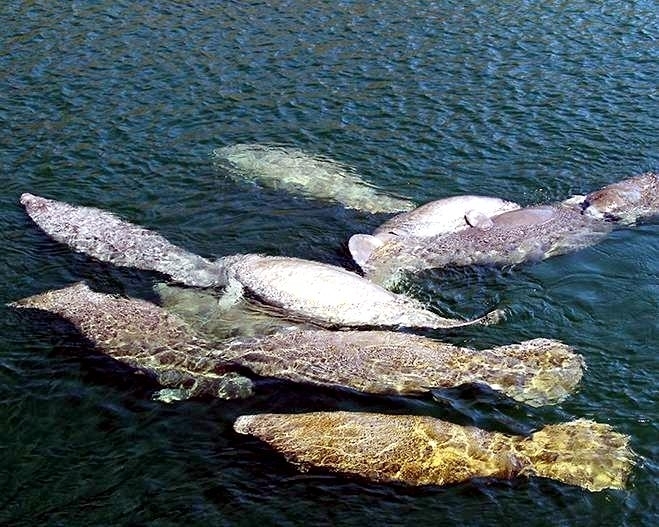 It is believed that they can differentiate between colors. 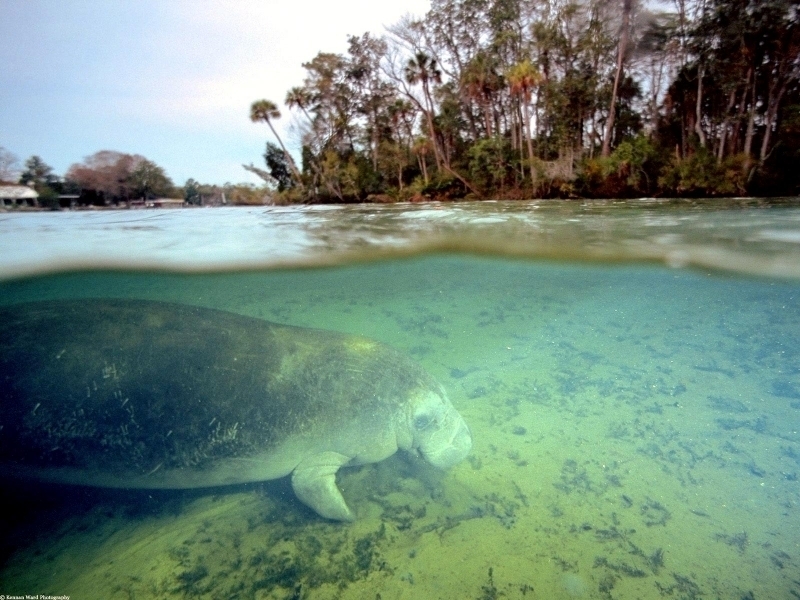 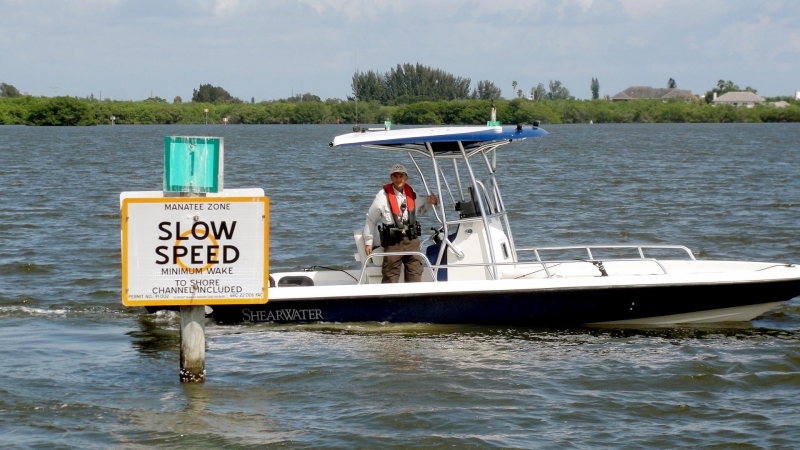 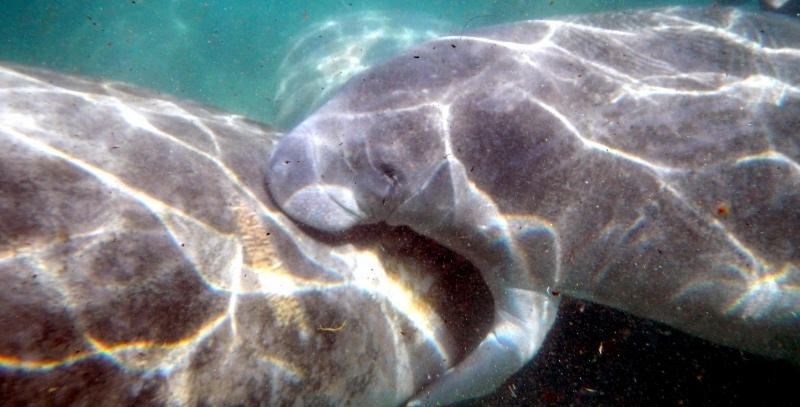 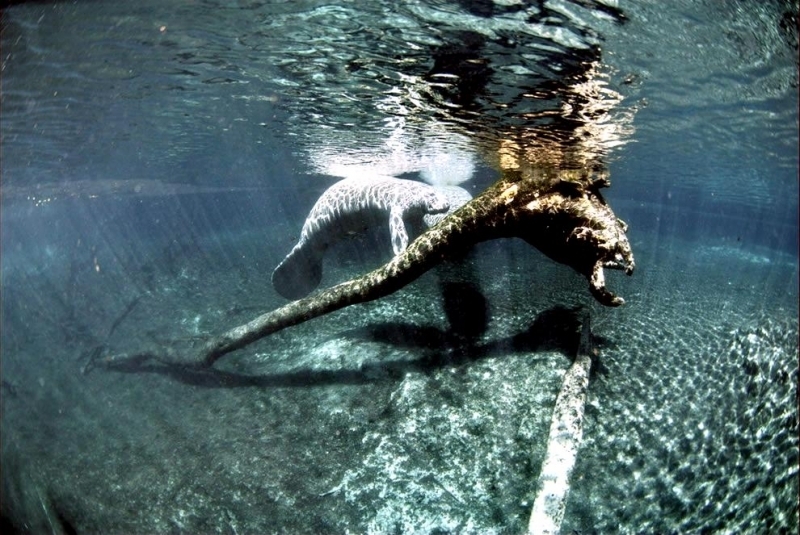 It is unclear how Manatees navigate in pitch black or murky waters, when their eyesight would be of no use. 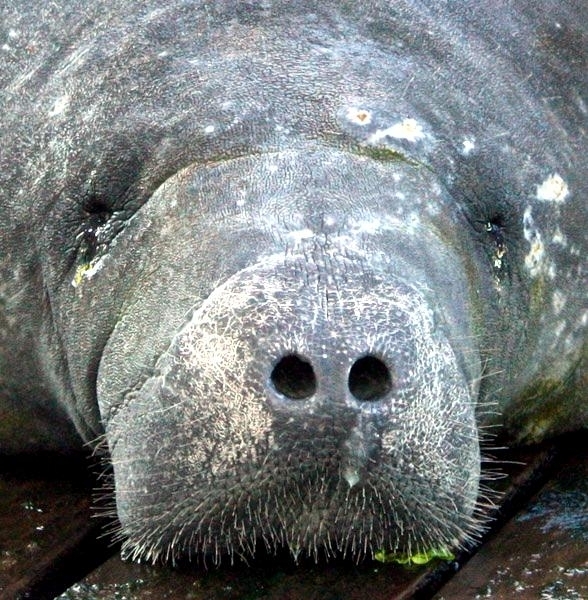 They do have sparse body-hair over their bodies and thick whiskers on their faces. 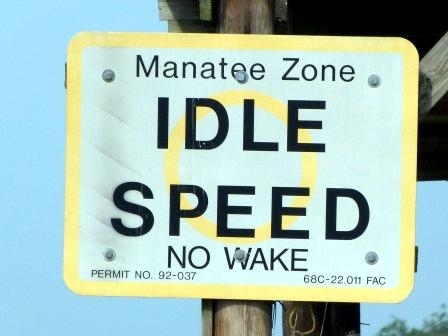 It is not clear if this aids in navigation. 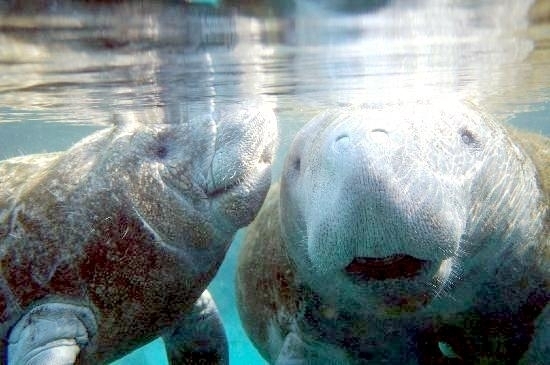 Manatees can hear very well despite the absence of external ear lobes. 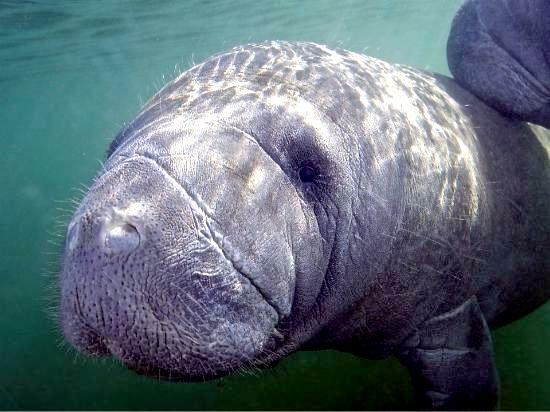 They are not believed to have the capabilities of echolocation but do emit sounds that are within human auditory range. 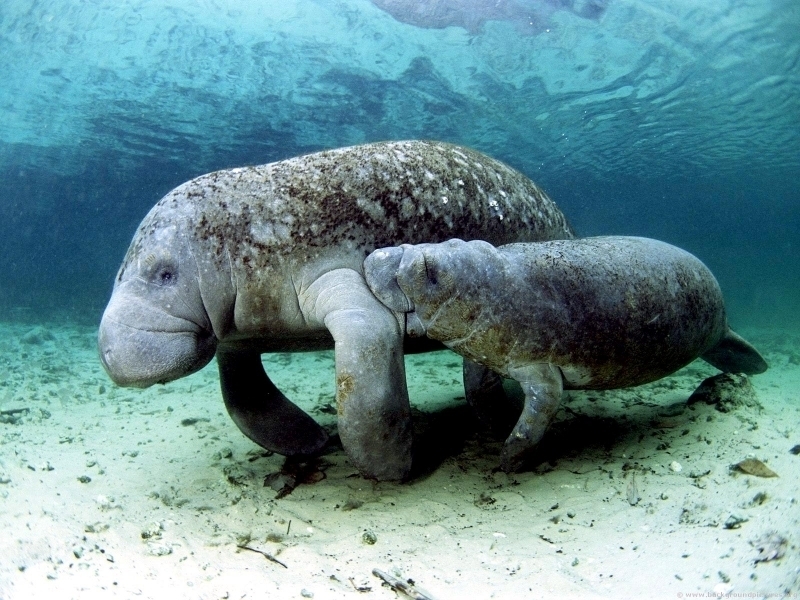 They make sounds such as squeaks and squeals when frightened, playing or communicating particularly between cow & calf. 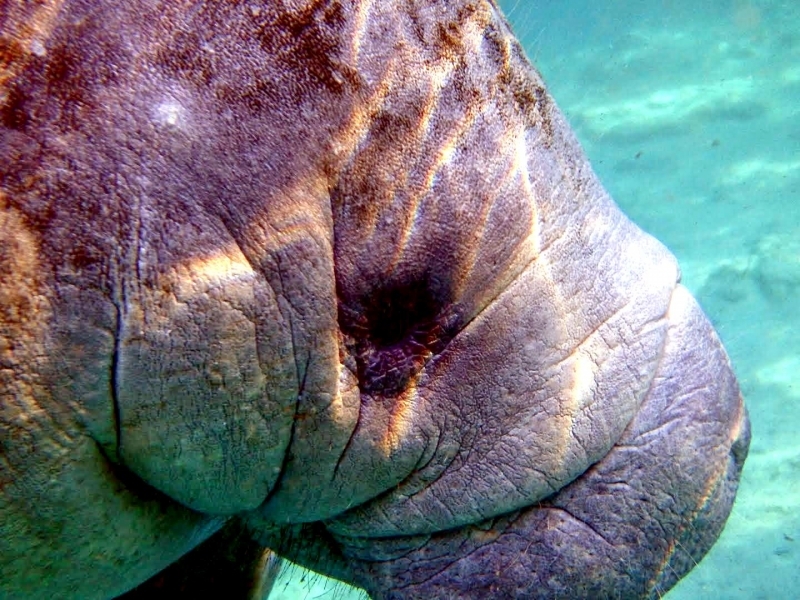 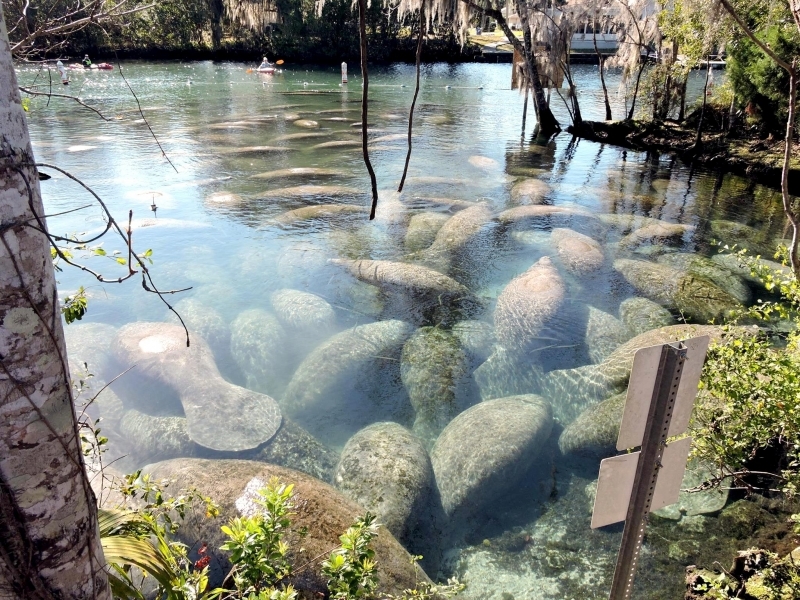 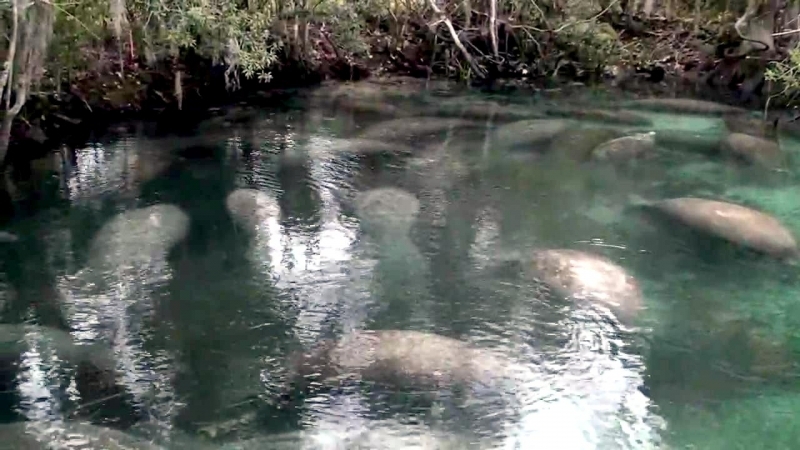 No air is released from the Manatee when these sounds are made and it is not clear where the sounds are being produced or if they serve any other purpose. 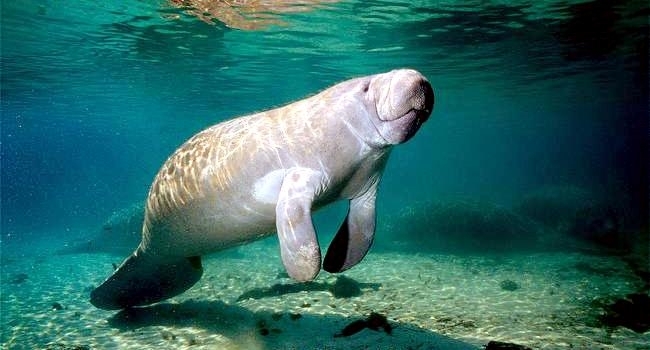 Manatees are found in coastal waterways, estuaries, saltwater bays, rivers and canals, particularly where sea grass beds are located. 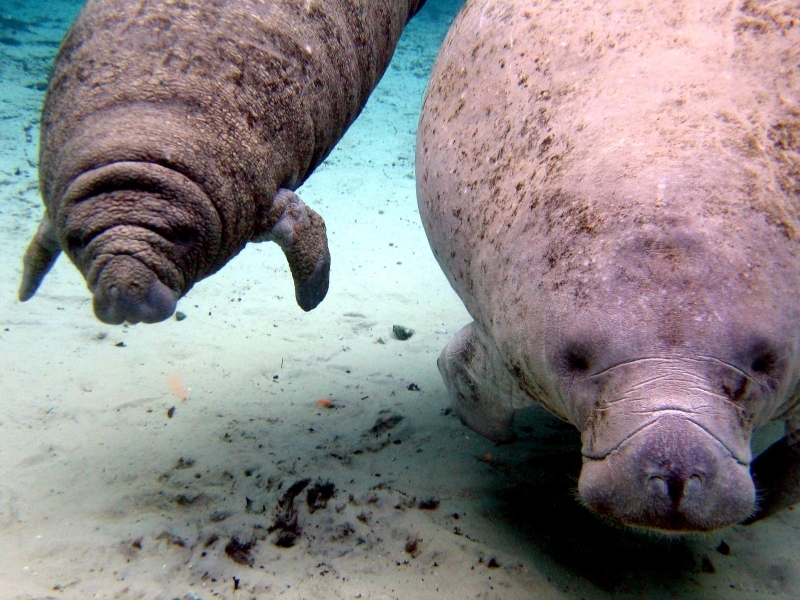 Manatees are completely herbivorous and can eat 10-15% of their body weight daily. 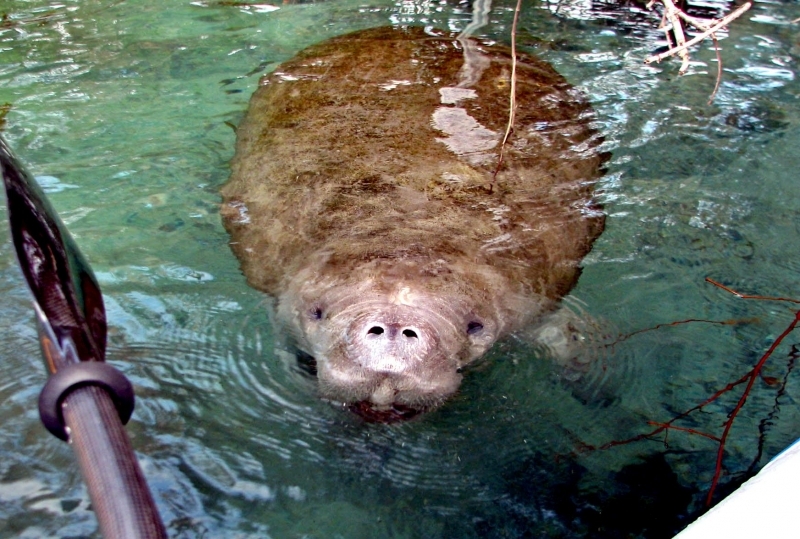 In captivity, they are fed lettuce and other greens & elephant vitamins. 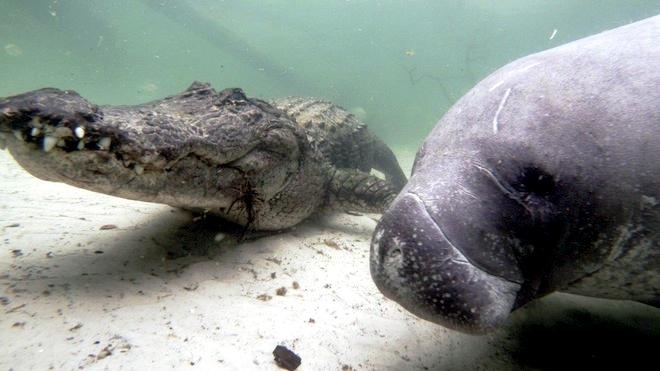 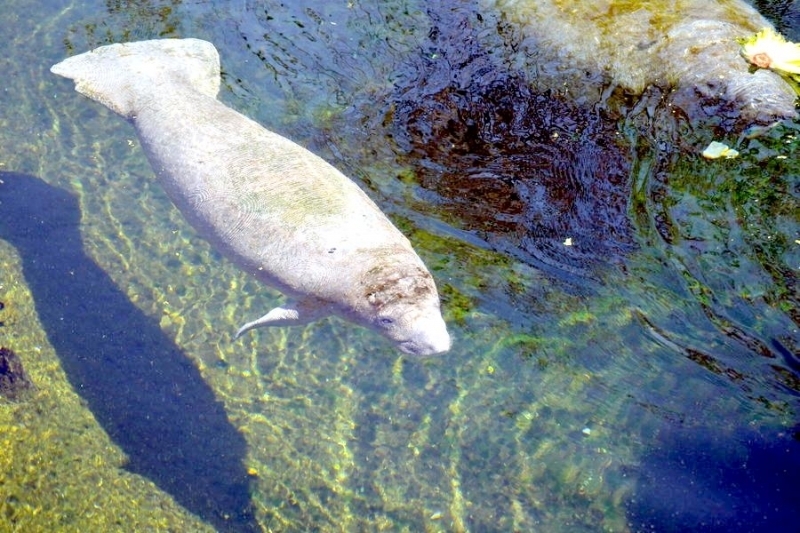 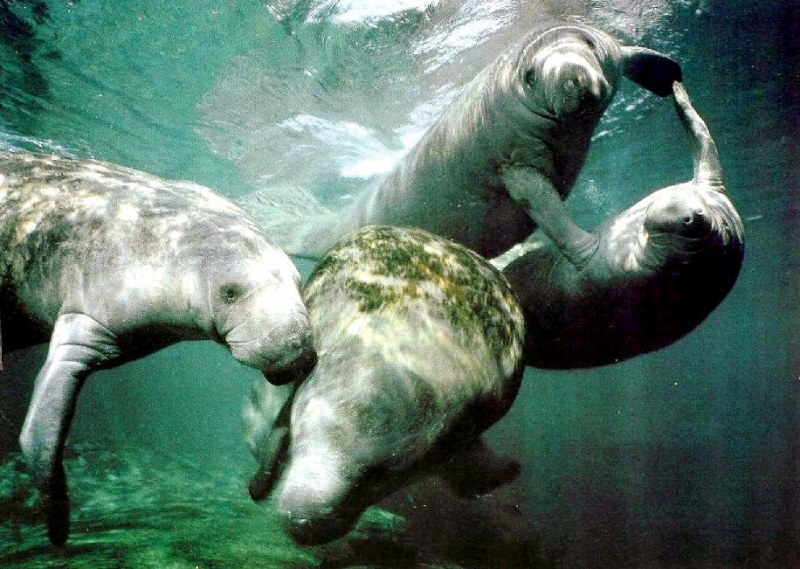 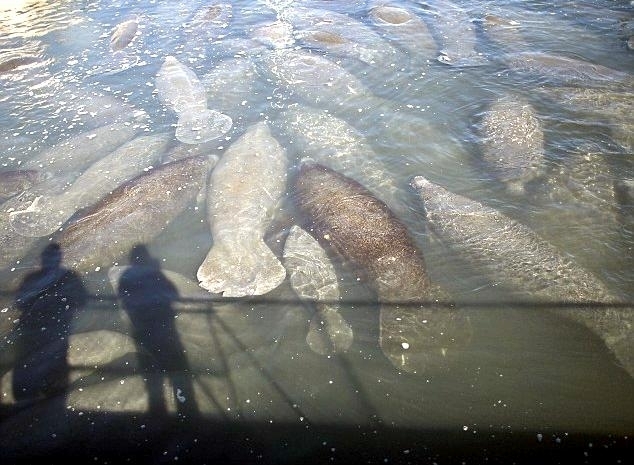 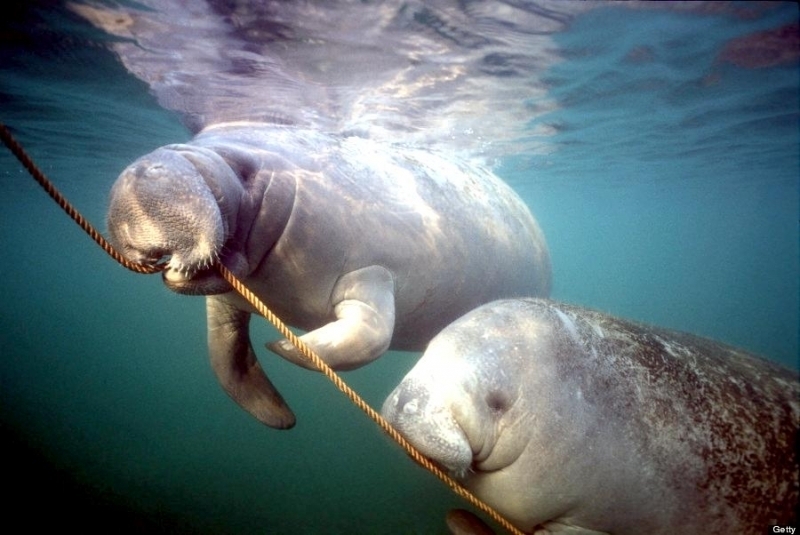 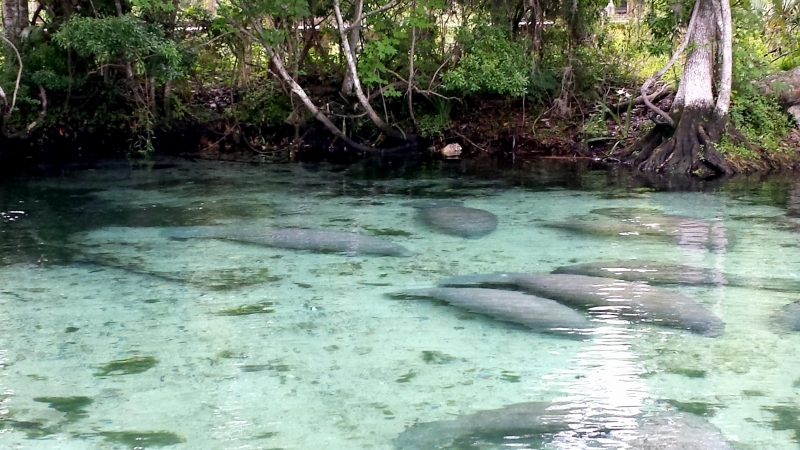 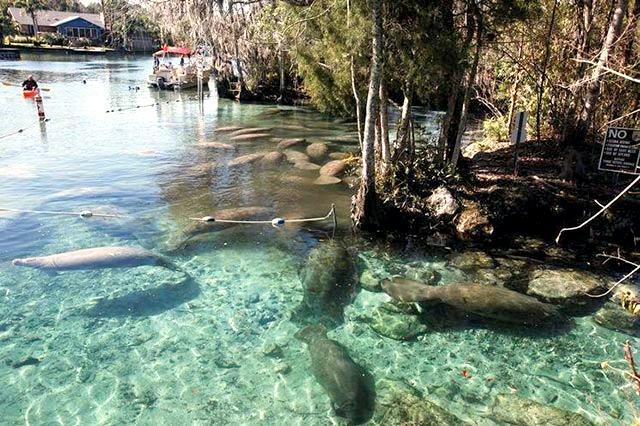 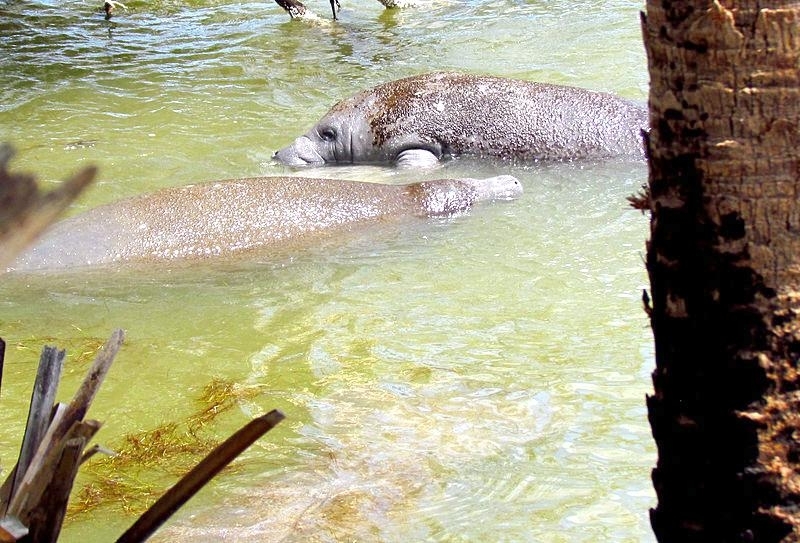 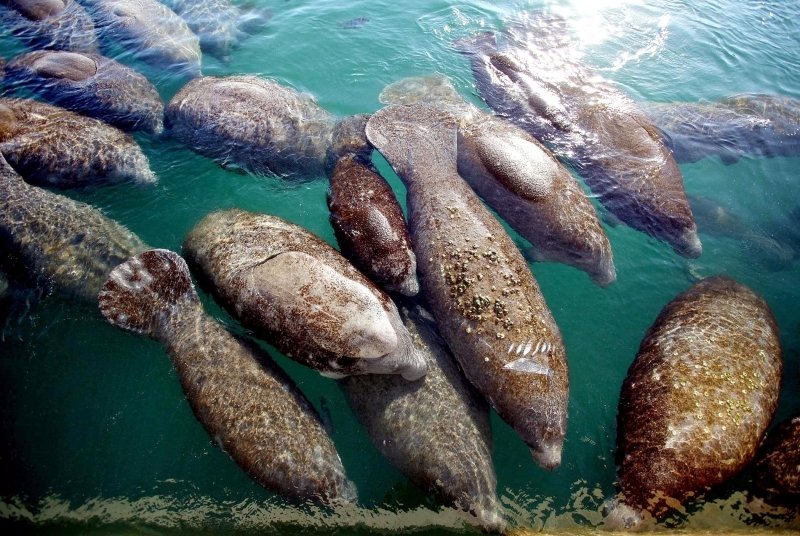 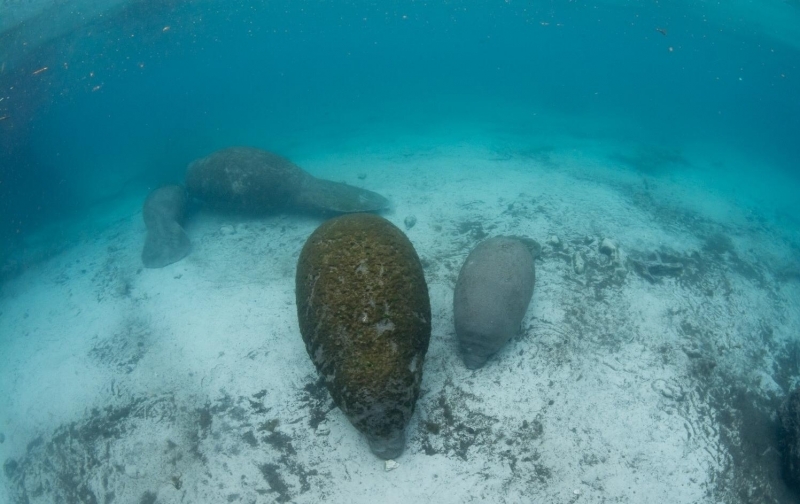 Female Manatees mature around 5 to 9 years of age and males after 6 to 9 years of age. 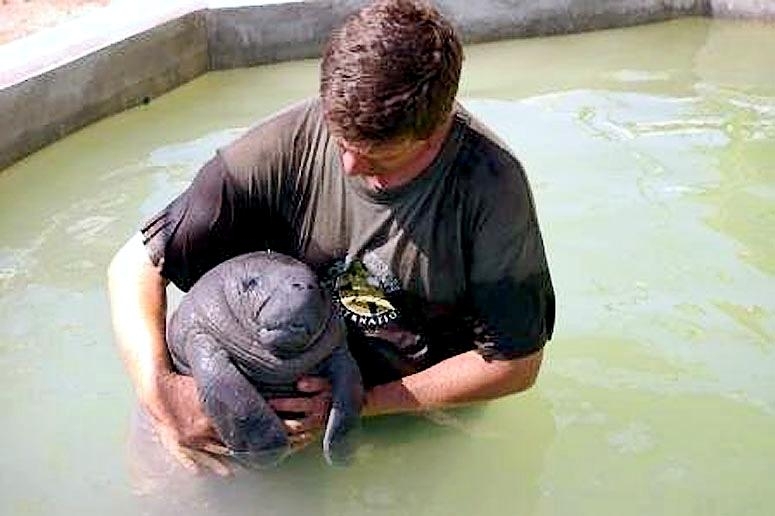 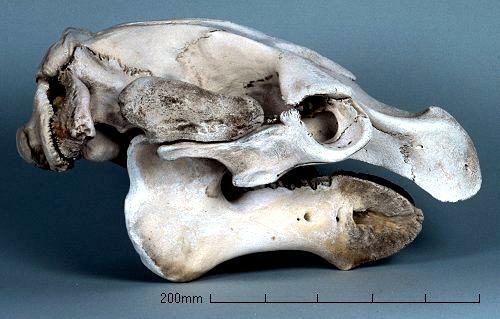 It is believed that 1 calf is born every 2 to 5 years. 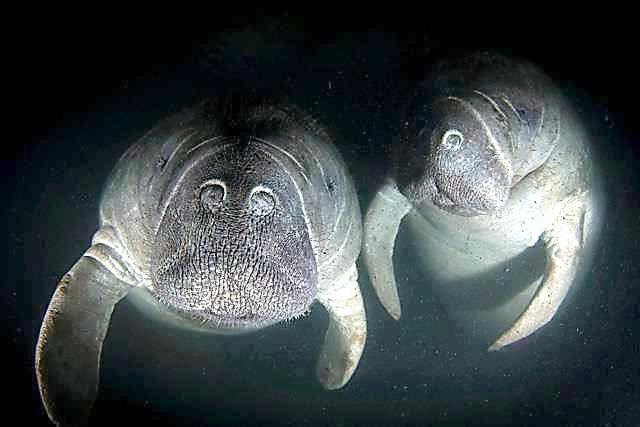 Twins are rare in the wild. 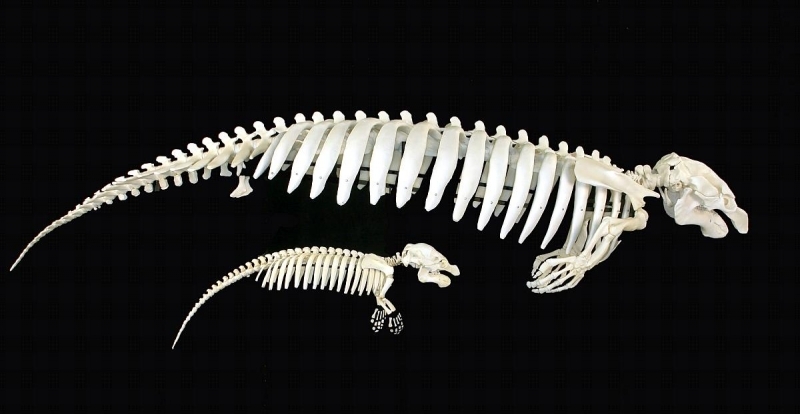 Gestation period is around 13 months. 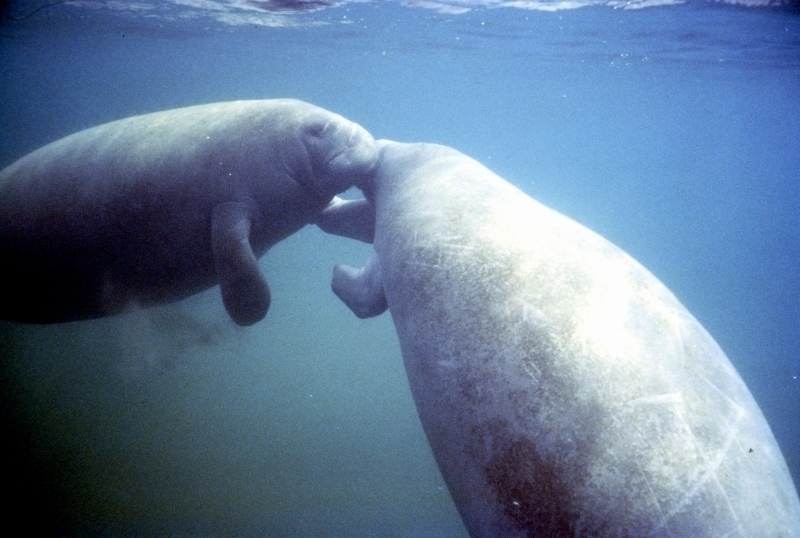 Newborns weigh approximately 40 pounds at birth and stay with them other for several years. 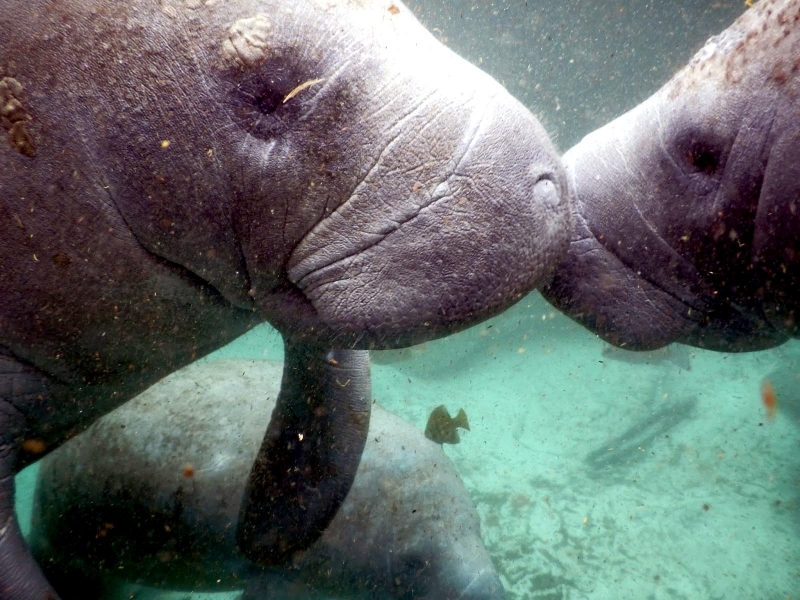 Manatees are mammals and breath air through their noses at the surface with nostrils which close tightly when submerged. 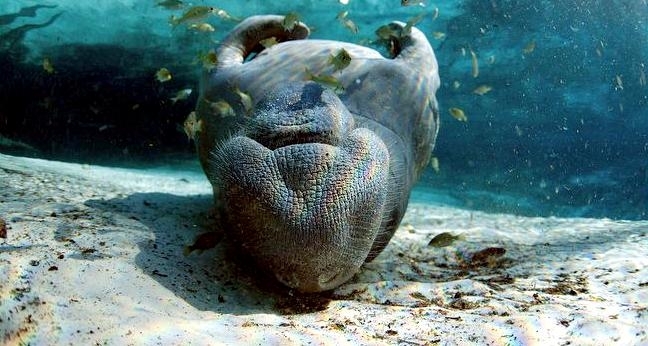 They breath every few minutes when active or swimming and every 10 to 15 minutes when resting. 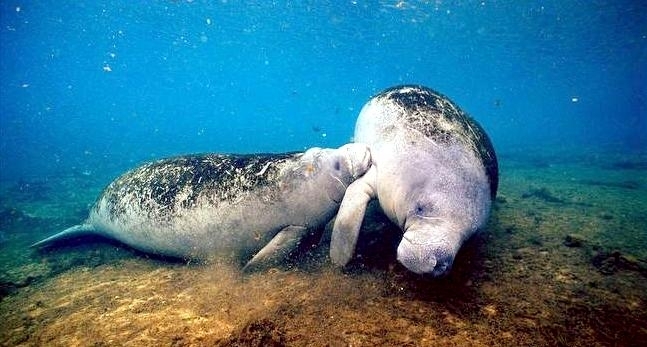 They are capable of exchanging 98% of their lungs capacity in one breath. 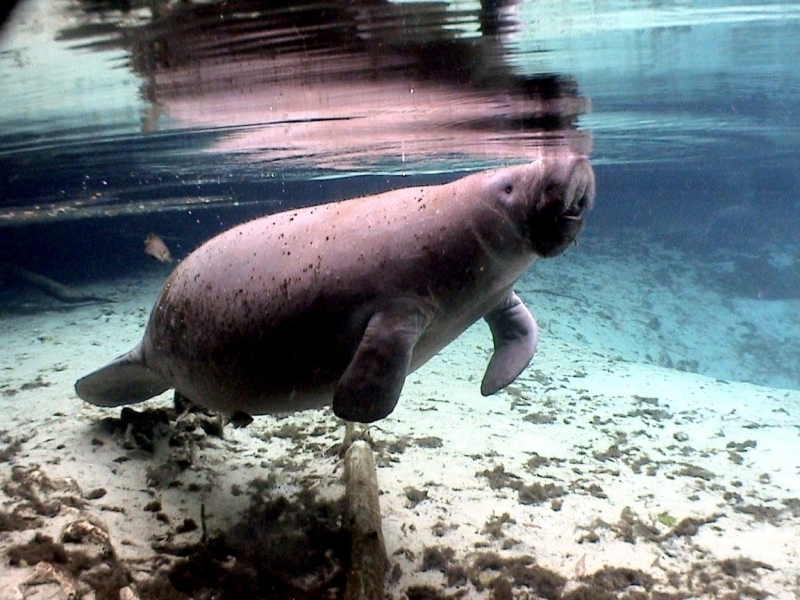 A Manatee’s lungs are very large and are also used for buoyancy control with a rushing sound of a deep exhaled breath sound much like a snorkelers. 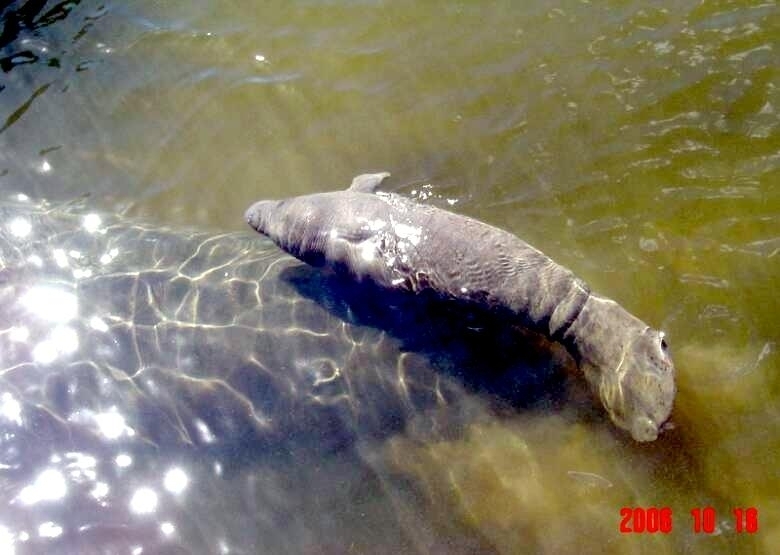 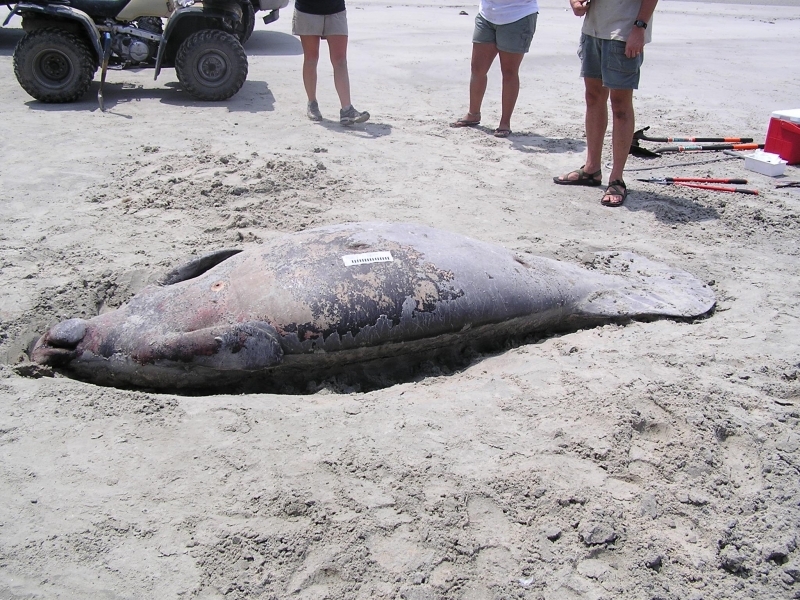 This sound and the associated “footprint” left by the tail & body at the surface are clues which reveal the presence of Manatees in the area.